Yes, Bibliocraft table with lectern. I tried it on a lark and really liked the look. You have to be sneaking to put the lectern on, though - a regular click puts it into the table display slot. 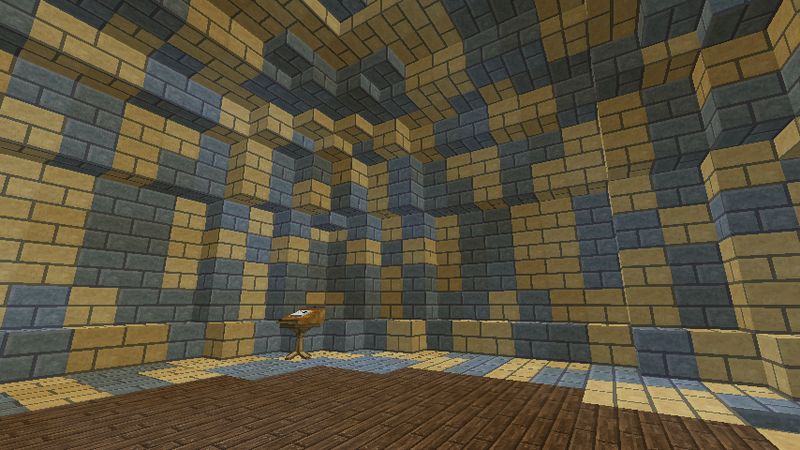 I really like the Bibliocraft Table + Lectern. 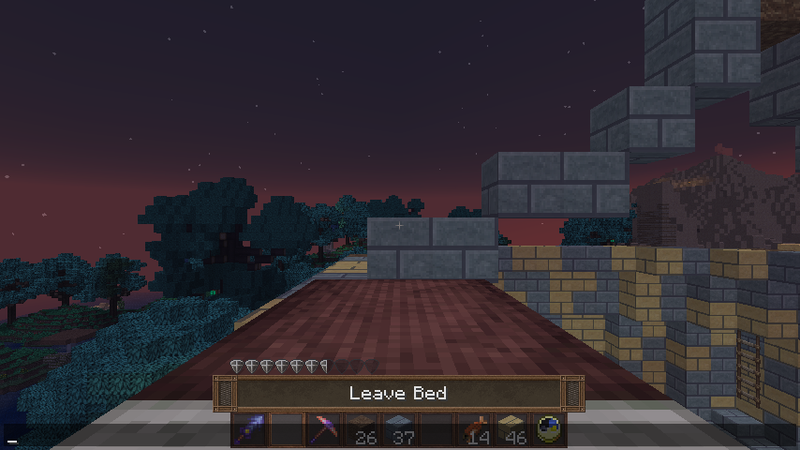 I'll have to keep that in mind if I ever end up using Mystcraft! Most interesting is that with a 4 chunk radius 1.6.4 shows a big spike at a density of 0 - no caves within that radius, while in 1.7 only a small percentage of chunks did with no spike evident; the curve was just starting to hit zero. In fact, there were even a few chunks, about 1 in 740, that had no caves within an 8 chunk radius (I believe this was for 4 million chunks, I just scanned an area +/- 1000 chunks from the origin and counted the number of caves in the given radius around each chunk, a pretty simple and quick thing to do). 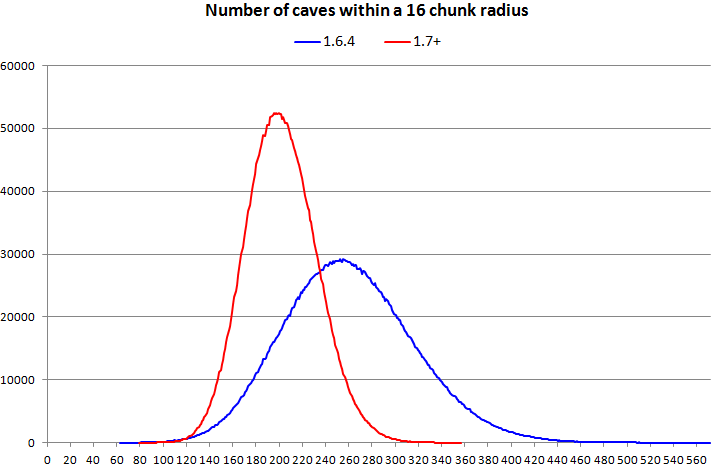 This is consistent with the code changes, which reduced the maximum size of cave systems from 39 to 14 but increased the chance of one generating in a chunk from 1/15 to 1/7. 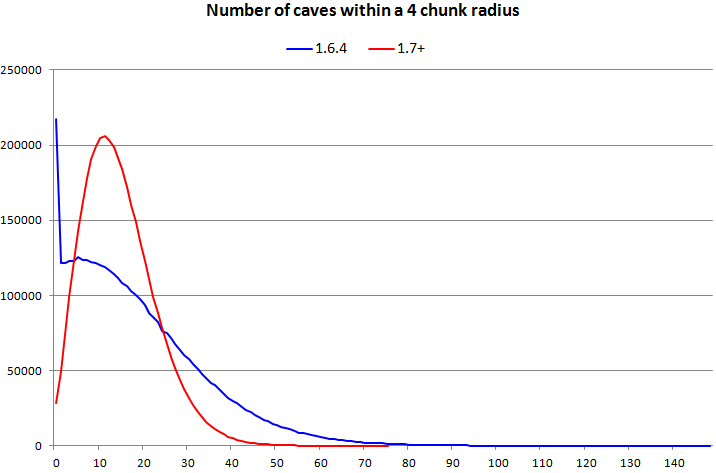 Conversely, if you reversed this and increased the size to say, 79 (actually, 80, random.nextint returns a number up to one less) and decreased the chance to 1/30, for about the same number overall as in 1.6.4, you'd get much more concentrated caves and have very large cave-free areas. IMO, one of their intentions was to make branch-mining a bit more difficult (they never did give any official reason or even mentioned these changes in the changelogs); by contrast, I didn't have much trouble with caves in my last world (modded, but caves were based around the 1.6.4 values). 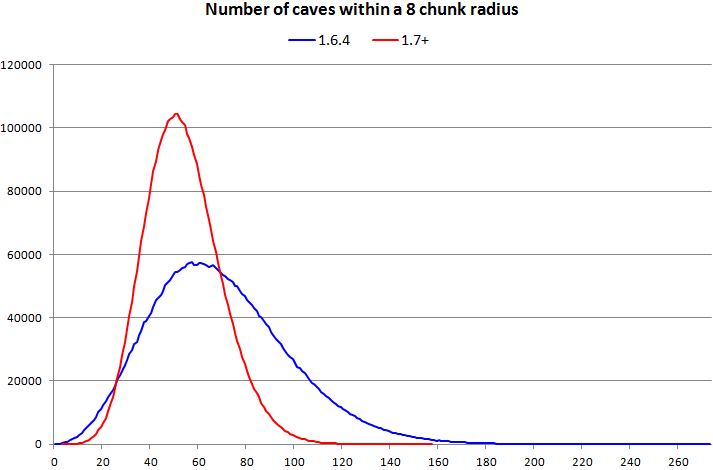 Of course, reducing density was likely another reason (if not the main one) but during this process they really sacrificed variation - note that across a 16 chunk radius there were anywhere from 60 to 570 caves in the 1.6.4 world, a ratio of 9.5, while 1.7 had 80 to 360, a ratio of only 4.5 - less than half the variation (and yes, that's correct - 1.6.4 can actually have large areas (512 blocks across) with less caves than 1.7!). It's so cool to see all that good data in a post! I always assumed the 1.6 -> 1.7 changes were to get rid of the swiss cheese cave systems. I know you like that kind of thing, but they generated a lot of complaints. If the intent was to harass branch miners it wasn't very effective. You can't branch mine in any direction but you can almost always branch mine in *some* direction. 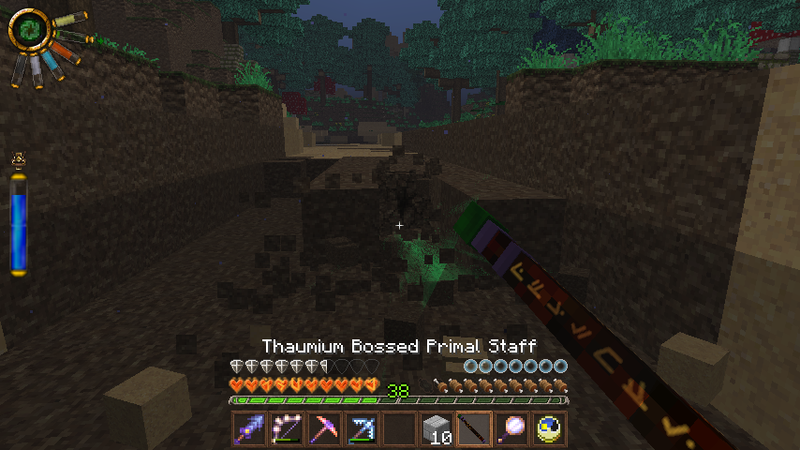 The only mine I've ever had trouble doing *any* branch mining was the first mine in this world, but that was from mineshafts, not caves. It's interesting that it's basically impossible to be away from caves now. The greatly reduced variance in cave numbers in even moderately large areas stands out. I've certainly noticed there's less variation in cave frequency from mine to mine anymore - all large mines feel pretty much the same. 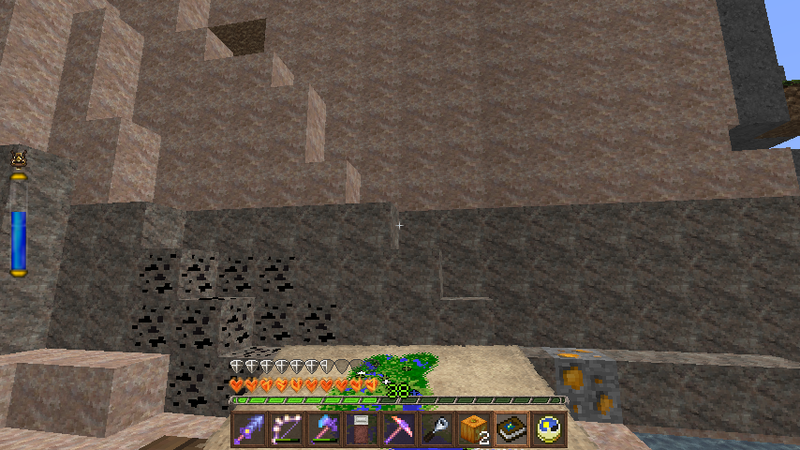 Before, there was a big difference between mines with caves everywhere and mines with caves nowhere. 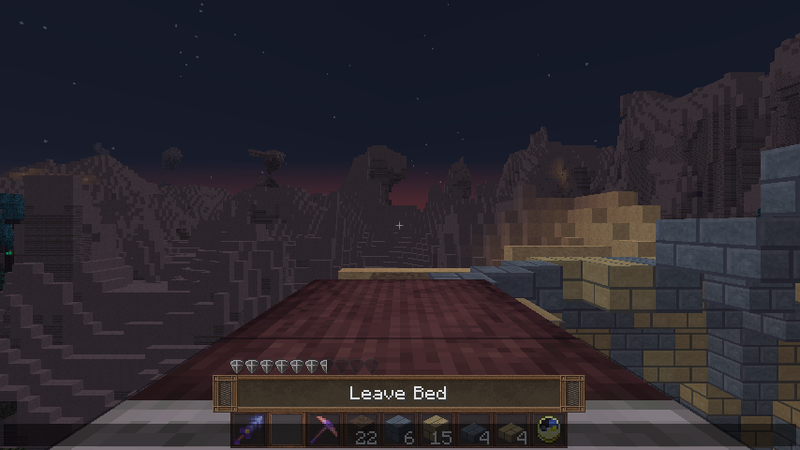 I'll still say I've had an annoying time with caves, though. 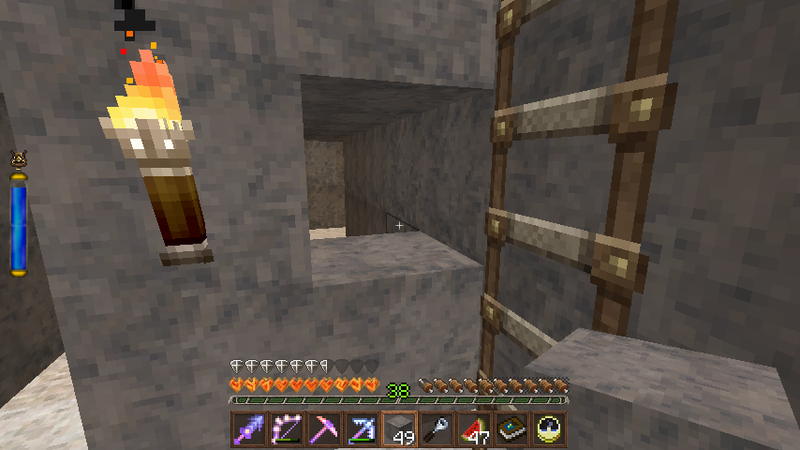 Of the five full-length dropshafts I've made, 3 have gone *through* caves on the way down. This isn't "caves in a 4-chunk radius" it's "caves in a 1-BLOCK radius". And one of the others was the one that landed in the mineshaft infestation. Wow loved the Info TMC, I was aware of the mineshaft information for the most part but the really nice to know about the cave system generation and especially in such a nice format! I don't understand; you make it sound like I was "wine" (whining) about the changes they made to caves and that I should use a mod that I made myself to fix them (I can even mod snapshots as long as they don't change the code). Considering also that I don't even play on 1.7+ and likely never will, at least in vanilla (even more likely for 1.8+, even more likely (yet again) 1.9+, and so on). Instead of complaining though I just use the launcher's ability to play older versions and/or my ability to mod the game. I had asked MogMiner back when the customized options came out if we could get some settings to tweak the cave generation and he said it wasn't possible currently. Back at the Winter Tower, I toss some Eclogite Cobblestone into the Infernal Furnace to roast. 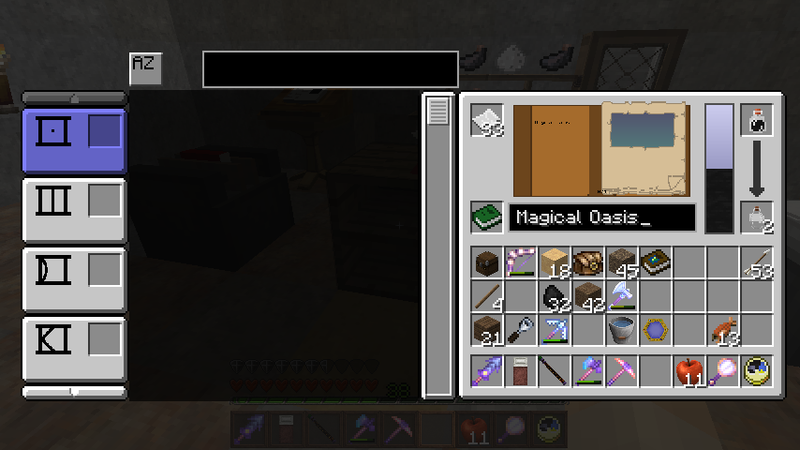 Next, in the Nether Nexus I'll now have four Mystcraft books leading back to the Overworld, but only one of them is properly named. The rest are just named "Overworld". I take my new link to the Cliff Shack and the one linking to Lazy River Landing to Fallingwater and rename them at a Writing Desk. I also make two new linking books so I'll be able to set up a link for the Arabian Nights build. 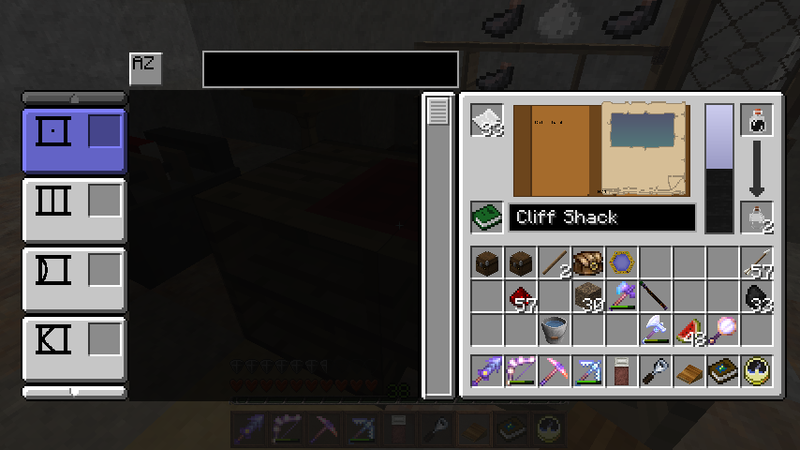 Then I return to the Nether to put the Lazy River link back, put the Cliff Shack link in its new lectern, and link one of my new books to the Nether to get back from the Arabian Nights build. 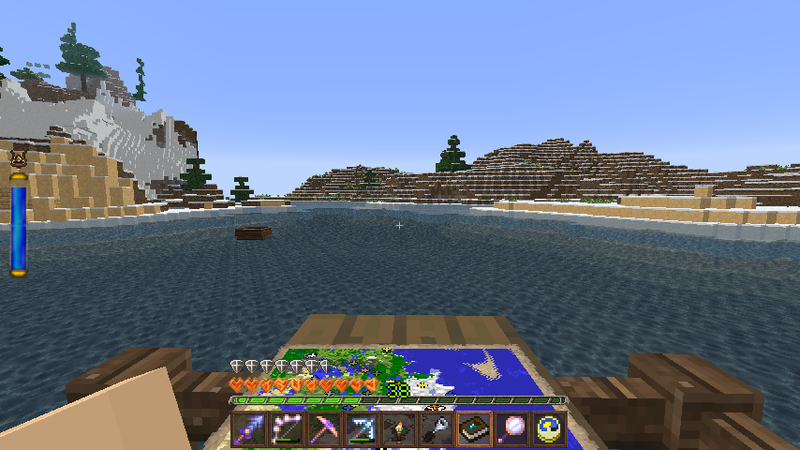 I have more stone to carry than I can fit into Trunkie and Spunkie so I traipse out to the boat to put some there (the boat has two chests). 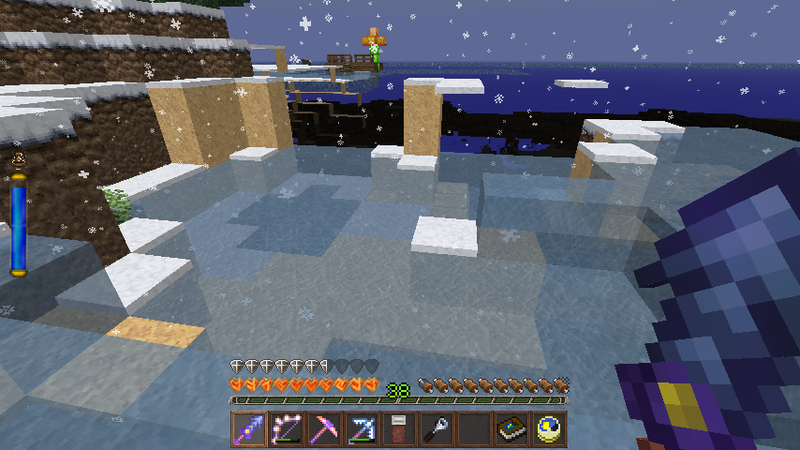 On the way I spot this hole in the ice which appears to have been created by a creeper explosion. "When did that happen? ", I wonder. I don't remember one, although I often play with sound off. 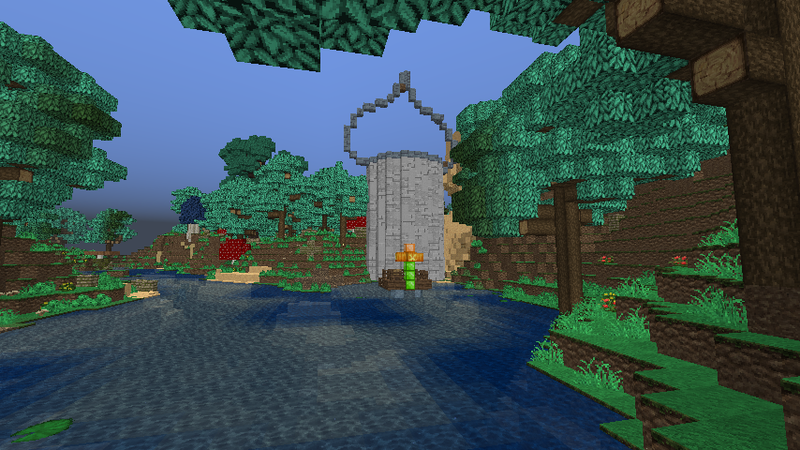 I stop to fix it, which turns out to be a lot of work because it's a hassle filling it properly with water. Eventually I do and things start freezing. Soon it'll be as good as new. One problem with my dropshaft system is that I can "slide out" into the little openings on the side I stood on while I was making it. 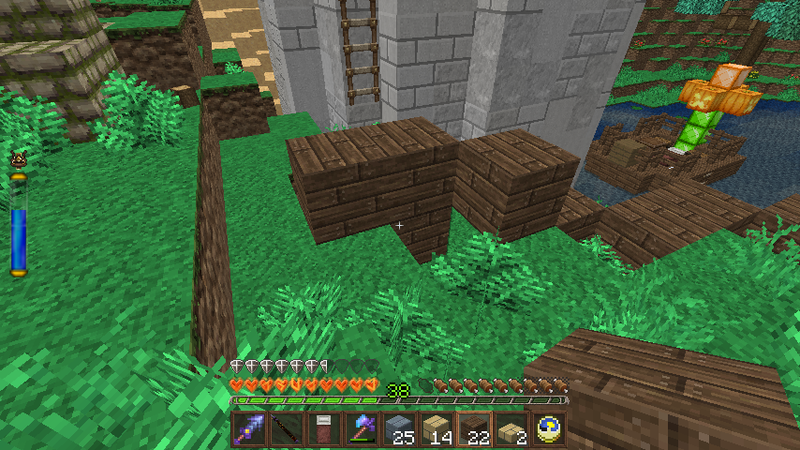 After building it, this can be fixed by putting blocks into the openings to reduce them to one block but I rarely bother. However, after getting hung up one too many times going up and down the Winter Tower Ladder I say "Let's do it" and block off all the openings that don't connect to something. I still have some trading supplies so I return to Lazy River Landing to put them away. 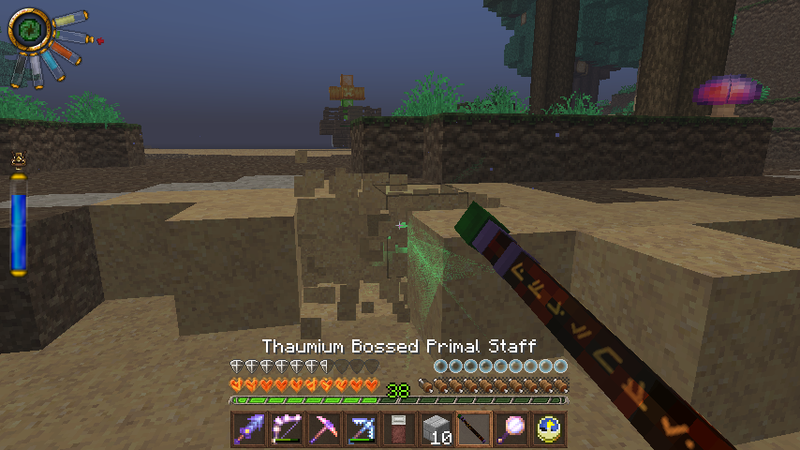 I check on the Fishing Golem, mostly looking for useful enchants, but don't find any. While there I collect some wool. What is he doing in the sheep pen? He seems to be a new priest so I guess he spawned outside of the village, unless villagers sometimes escape fences like livestock. He's not going to live long, sadly, because the zombies will kill him out here and it's way too much trouble to rescue him. I do some Enderman checks but one disadvantage to the trophy hall is that now there's not much clear space to the west anymore. I don't see any. I do see this dark area on the roof - not sure how it got here. 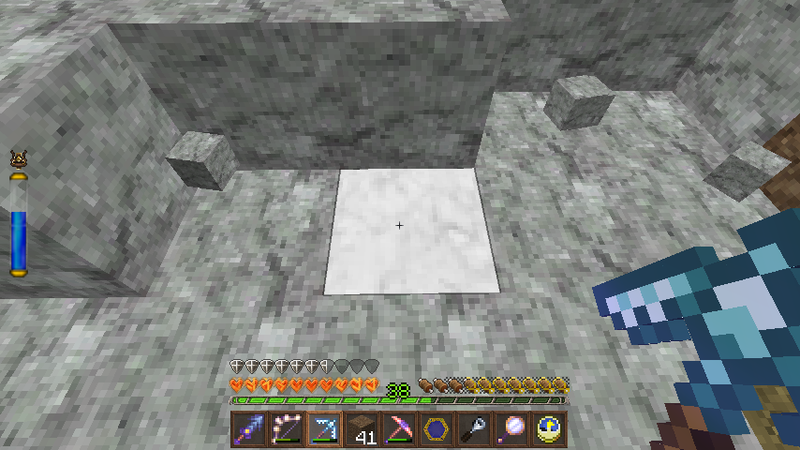 I make a torch to place here. On the way back, I see a zombie between the trophy hall and the main village. I kill him and *hope* he spawned here because otherwise I have a lighting headache. Back at the Winter Tower I load up on my now-roasted Eclogite, and pick up some Blue Schist for additional color options. I'd actually been thinking Green Schist, but I don't have much. 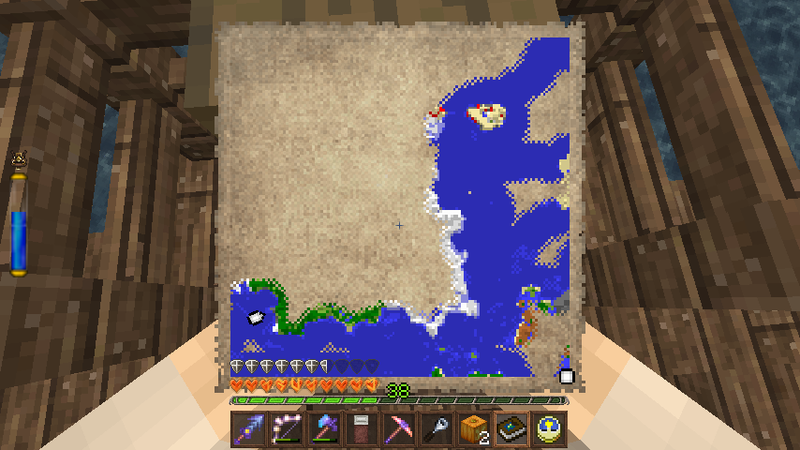 My plan is to head to the island northeast of the spawn continent and explore it. 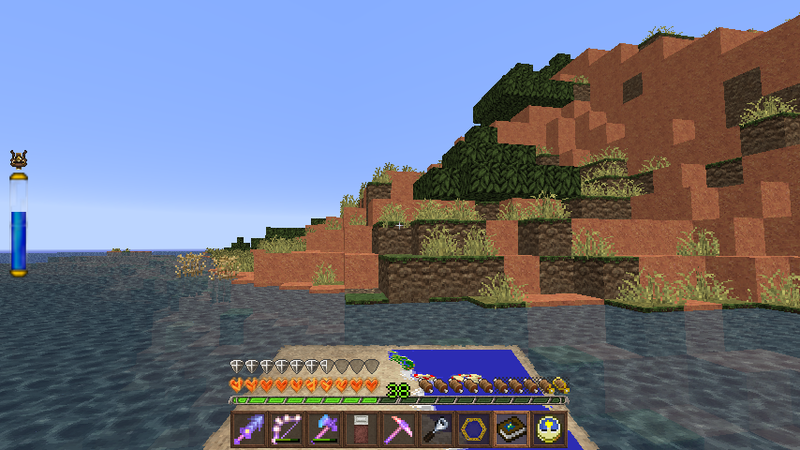 This is the island I partially explored in Episode 51 but had my explorations wiped by a crash. 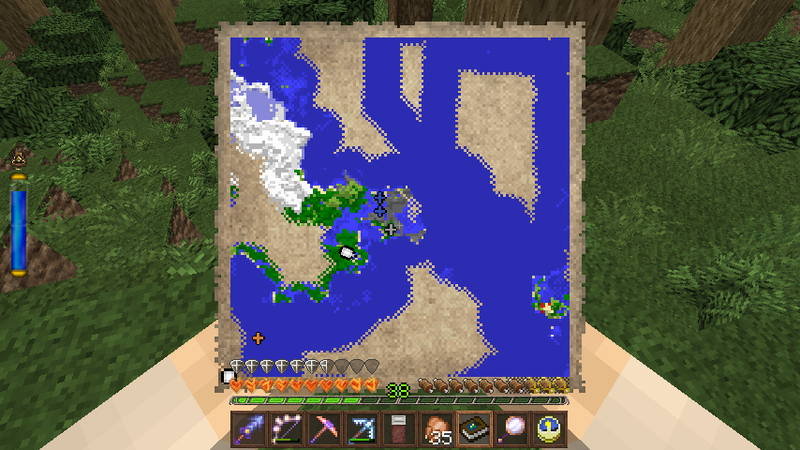 I plan to explore some ocean along the way, and then afterwards some more ocean right around the island, and then head east to where I'm planning the Arabian Nights build. On the way I pass some of the coast I saw on my very first boat trip 162 episodes ago. I get a little nostalgic at this, one of the great pleasure of a long-running world. 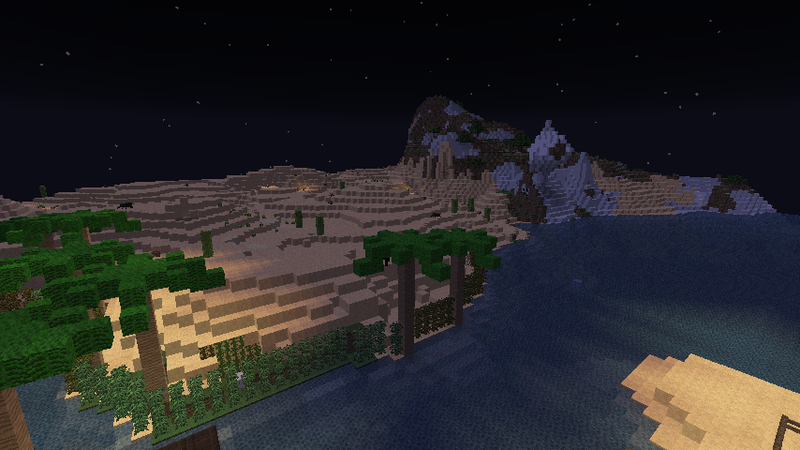 This is the bay where I found my first sugarcane (oddly). When I was still boating to Lazy River Landing it was acting as a port, hence the derelict boat afloat there. 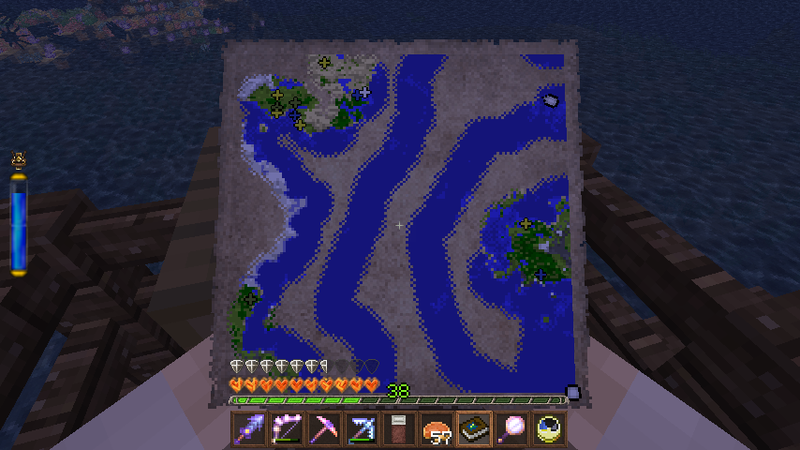 This is the map of the straights between the spawn continent, on the lower left, and the island I want to explore, on the upper right. I've been working on this map a long time. 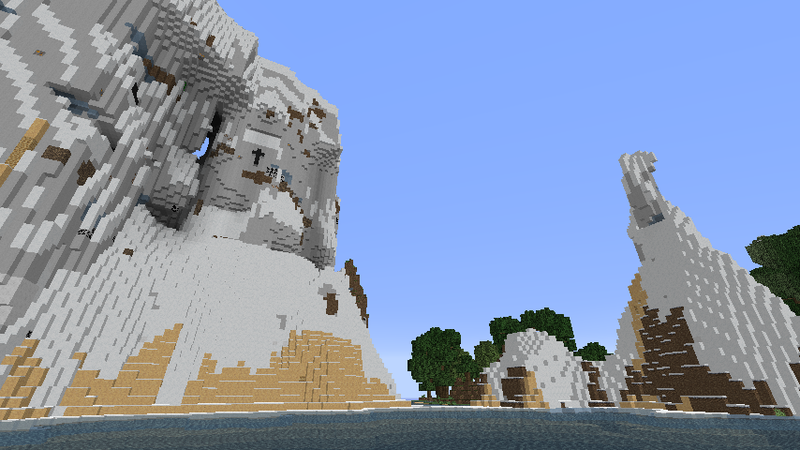 The coast of the spawn continent I first explored in Episode 17 and the coast of the island in Episode 35. 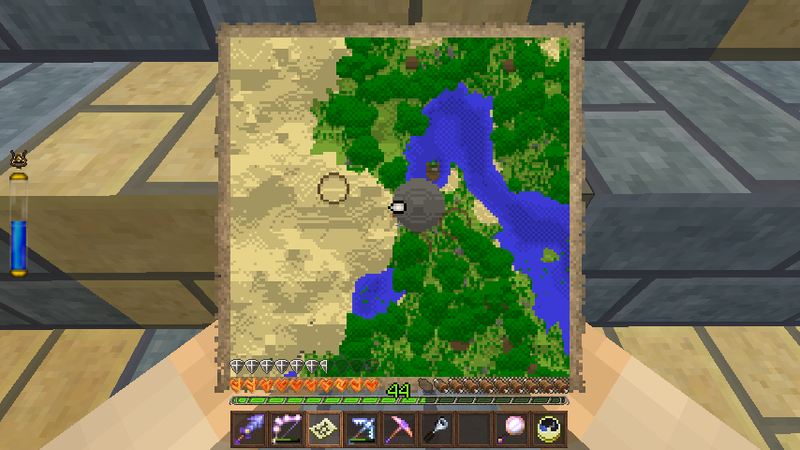 I've had two more exploration expeditions that picked up some of the map - but it's still not done! I correctly surmise it'll produce a great scenic shot on the way in. Next episode: Island (re-) Exploration. Now with fewer crashes! 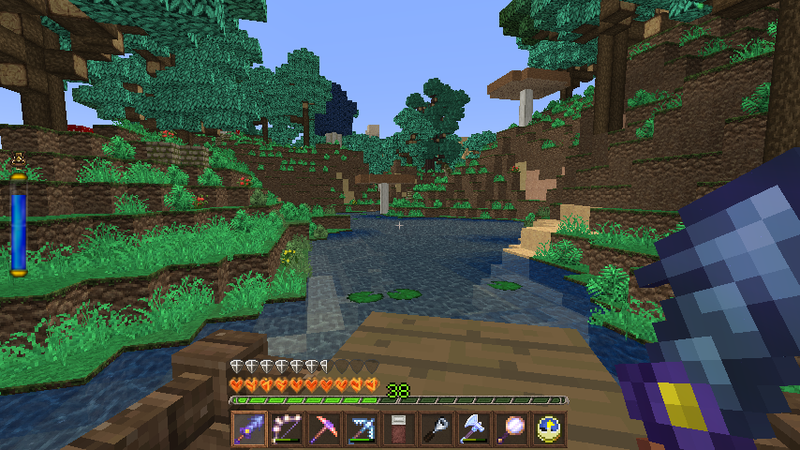 About that mysterious "creeper hole", that doesn't actually look like a creeper hole to me, it looks more like a pond generated on the beach and froze over. 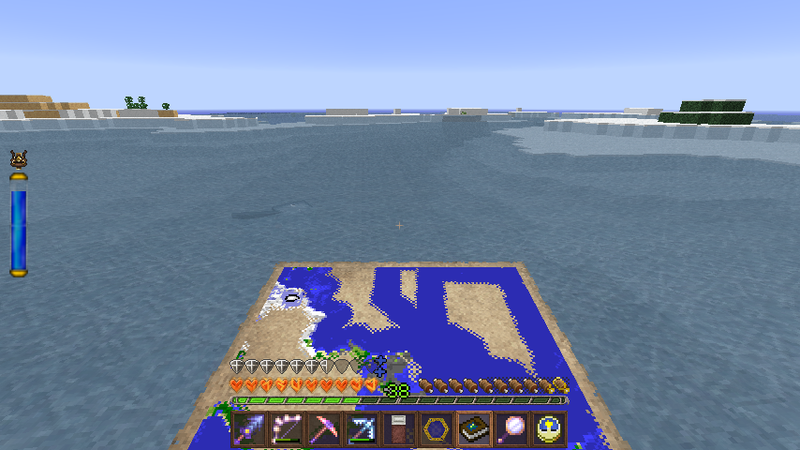 I remember that used to happen a lot before the generation changes in 1.8 beta, even over open frozen water. I'd never seen ponds in ice but more significantly that's right next to the frozen river I use to get on my boat from the Winter tower. I've seen that spot dozens of times and I think I would have noticed *that*. I suppose I can check one of my old saves. Edit: No, Empour's right. I have no idea how I could have forgotten that. I'm going to go roughly clockwise so first I'll head up to the snowy area, which is a Glacier here. It's very steep and I'm forced to fly to get up it. I had forgotten what spectacular vistas Highlands can produce. It's actually Cold Taiga M. This is the first time I've *noticed* being in Cold Taiga M although I'm sure I have been before. 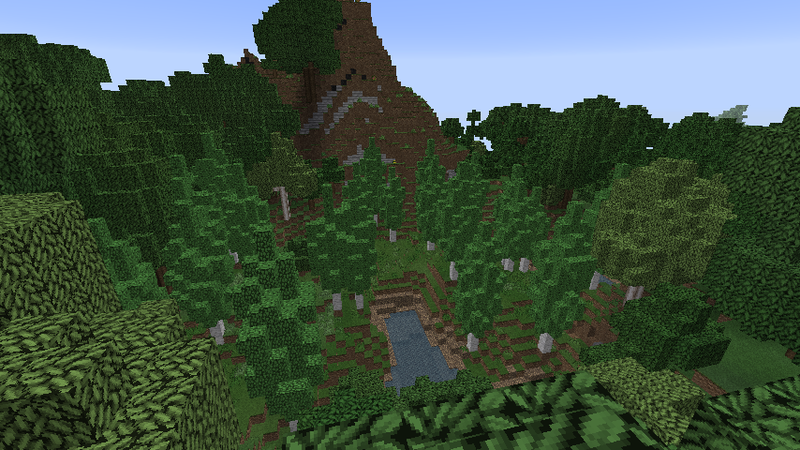 Like many M biomes, Cold Taiga M is just slightly hillier than Cold Taiga proper and doesn't really stand out. The combination of that with bleedover from the Glacier was enough to make it seem odd. I grind north through the Cold Taiga, encountering nothing particularly unusual. At the top of the island it connects to a medium island with Meadow but I've already got that on my maps. I turn east instead. The top of the island is Highlands Tundra, but mostly frozen lakes. I go super fast on ice due to my magicked boots so this part is very quick (and kind of fun!). After a while I have to go back into the Glacier. 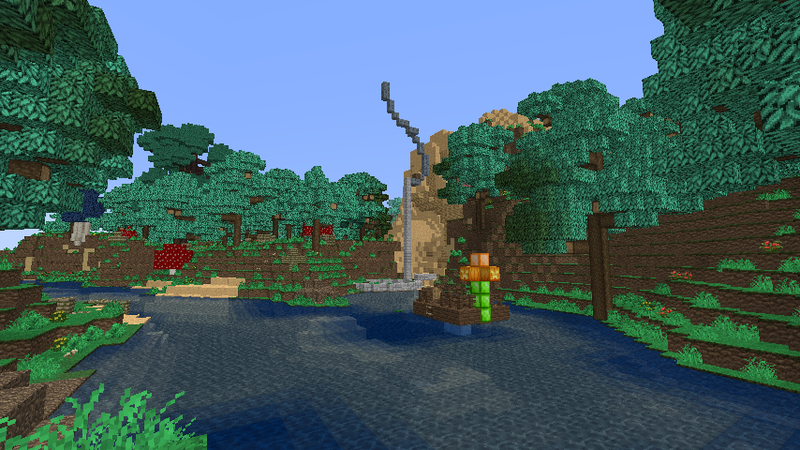 Here the biome is wider so there are more ups and downs. I like the way the forest blends into the Glacier here with the trees getting rarer and rarer as they go up. Continuing east from the Glacier I pass into some Woodlands. I use my tree-hopping trick, which works here. I spot this glade of Poplar trees (from Highlands Birch Hills). 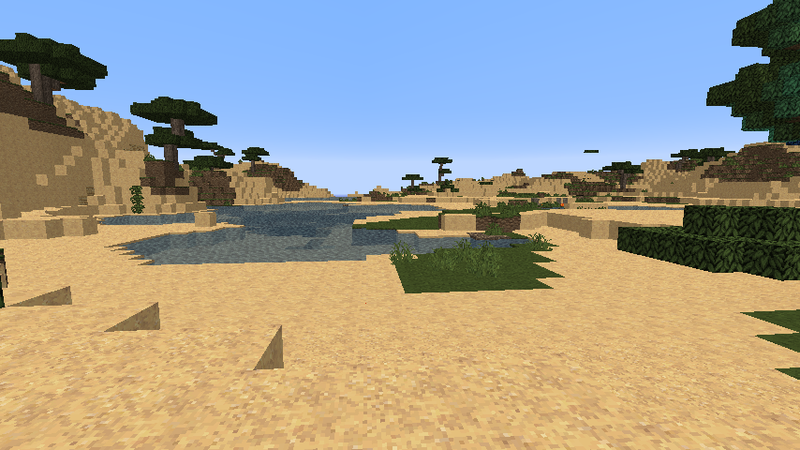 It looks like a sub-biome but Climate Control doesn't have that sub-biome assignment so I'm not sure how it got here. 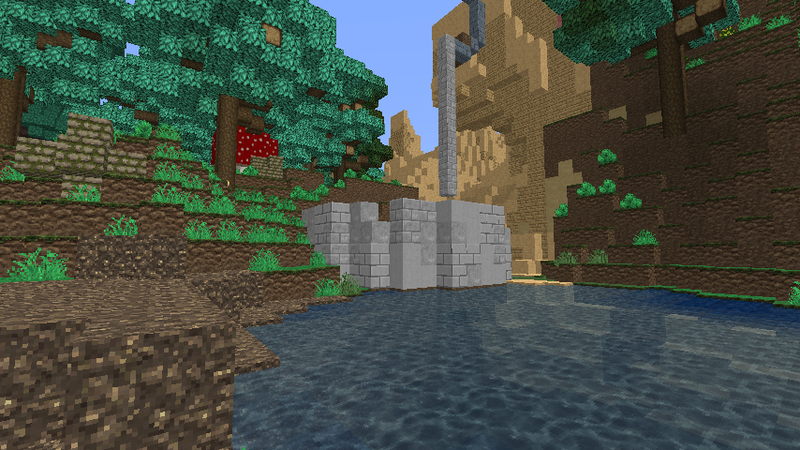 I check to make sure that the chunk wall protection system is working and it is. So I just toss it onto the "worry" pile. Next I pass into a Redwood Forest. The gray area to the right is the Rock Island where I quarried for Gniess back in Episode 62, and also the location of Cape Crash. This great view of the Magical Forest in the center of the island, with the great Glacier overhead. The Magical Forest is full of wolves in case I want to get new dogs. I have a nasty surprise when I get seriously poisoned for no obvious reason but I realize I must have walked past a Vishroom. Pretty, but nasty. 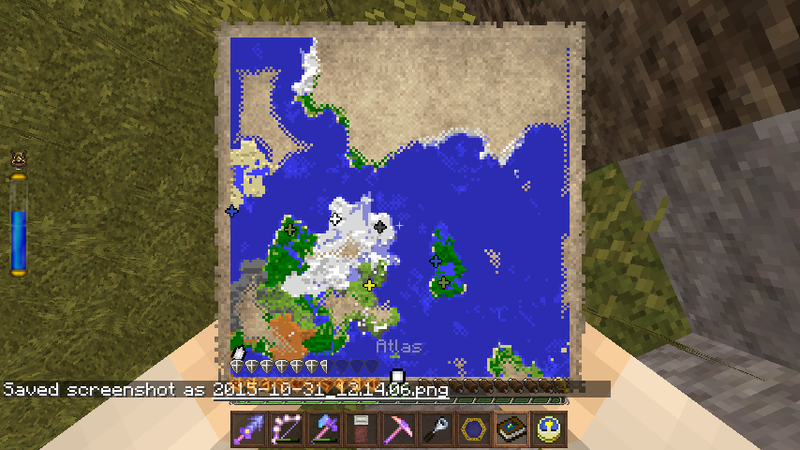 I'm almost done but there's still a small area unmapped in the center. It's basically Woodlands and Glacier. 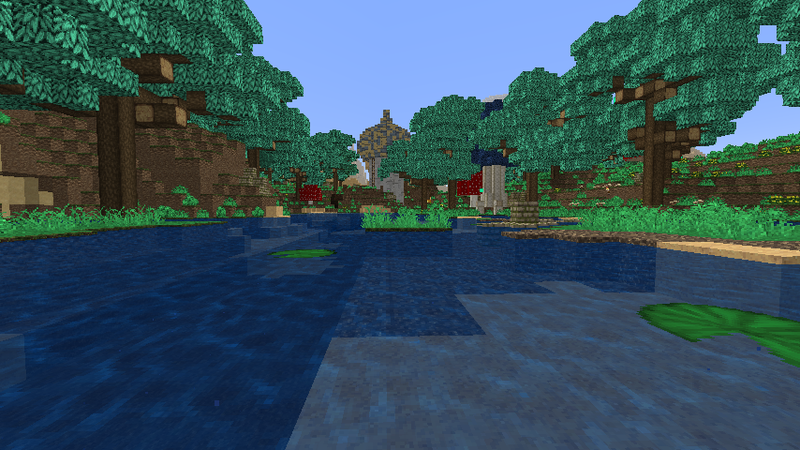 In the Woodlands I find a Plains sub-biome but that *is* supposed to be there so I'm not bothered. Soon I'm back on the boat. I had planned on exploring the ocean around the island but I've been doing a lot of planning for the Arabian Nights build and I want to get to it. So I just head east in the direction I want to go. Night falls when I'm on the boat so I do some nighttime oceanic exploration filling in some areas in largely explored maps. 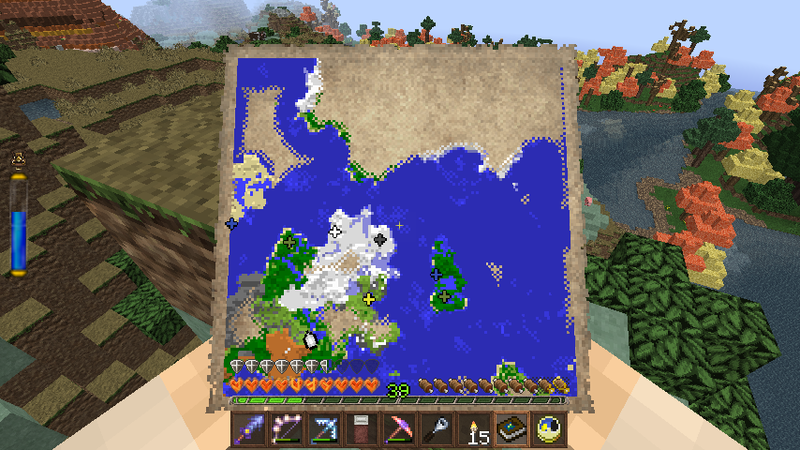 The only discovery of note is that one small snowy island to the northeast of the spawn continent is actually 2 islands. As dawn approaches I'm on the map with the target Magical Forest (3 maps east of the one before; I've travelled a ways). The Magical Forest is the green area on the southwest tip of the land in the northeast. The yellow and tan area to the left of it is Dunes and the yellow area with green spots above is Sahel. My generic plan is to build the palace in the Dunes overlooking the Magical Forest with a bridge or walkway to it, but I'll have to see what I can do once I get there. My timing is good and I arrive shortly after dawn. A year after first finding it, I'm ready to start on the build it inspired. I had developed a fairly elaborate plan in my head. The main palace would be built into a steep mountainside with a garden dug into the hill overlooking the forest. There would be towers scattered about on the mountain, and a grand bridge over the river between the Dunes and the Magical Forest to some guard towers. I arrive to a lesson in the fallibility of memory. Over the year since I actually saw this I've conflated and exaggerated features in my head. The steep mountains are on the ocean, not overlooking the Magical Forest. The river doesn't strictly separate the Dunes and the Magical Forest, and I don't see any good places for a grand bridge or the associated towers. The view from this overlook isn't as imposing as I'd hoped. Also, although you can't see it from this pic, Dunes is also very irregular and it's hard to find a good spot. My earlier amorphous idea could have included simpler towers but the broad onion domes I'm currently thinking about don't get along well with slopes. So I head north along the biome boundary. A ways to the north I find this hill that projects into the forest, making for a nicer view. It's smallish, though, and I could only fit one tower up here, and certainly no grand cavern gardens. From that hill I can see a mountain to the north. 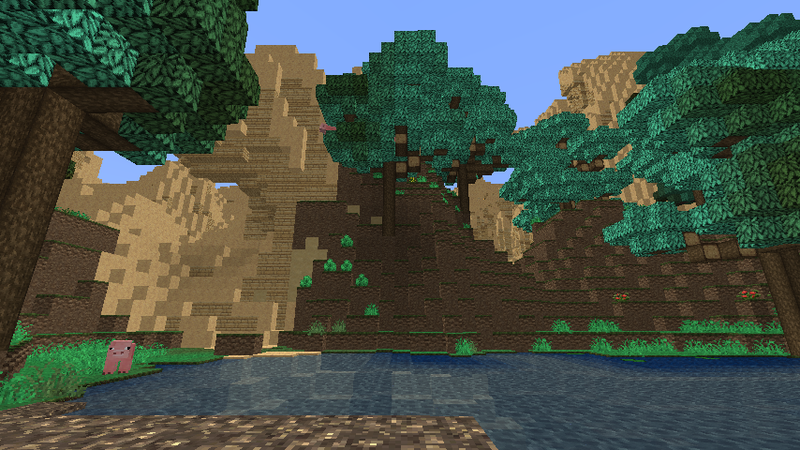 This face of the mountain is close to my idea as the site for a cave garden, but it would face in the wrong direction. Still, I consider the possibility of having a gatehouse here and the palace on - and in - the mountain. The top of the mountain has a nice view, but all told probably not as good. Builds on the tops of mountains often look very imposing, but from a great height views become more 2-dimensional and less beautiful. 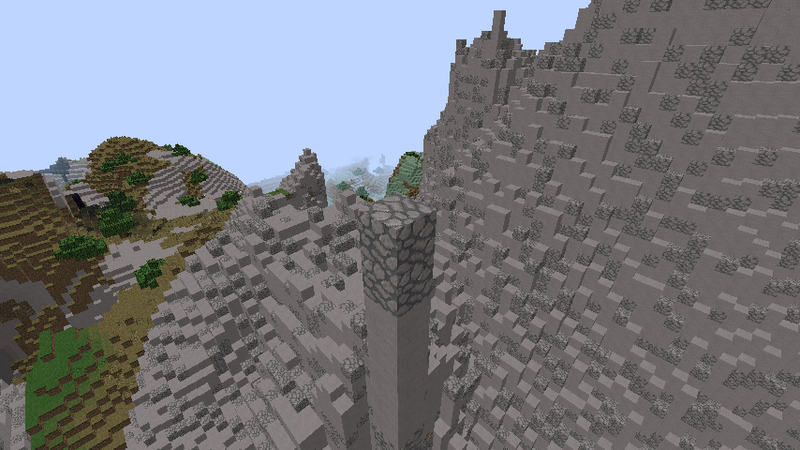 Also, a looming mountain is a good component of a view and this spot is high enough there's nothing above it. These problems will get worse with a 30 height tower on top, too. I head to the bottom to check the view from there. 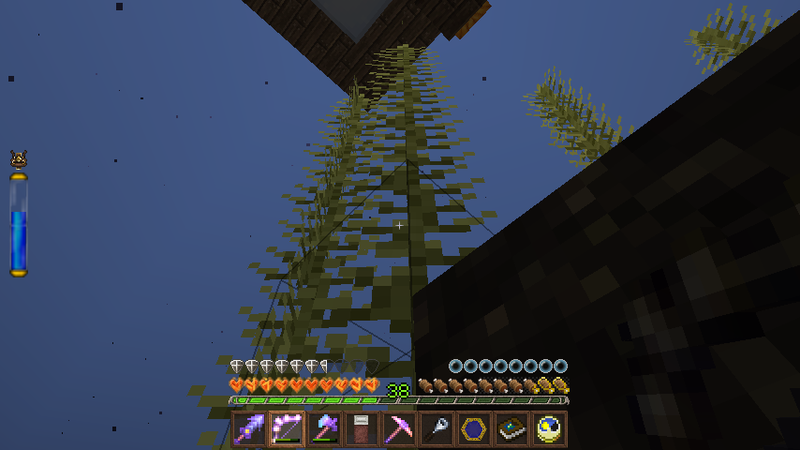 There's an imposing Greatwood but - oh darn - cobwebs - it's got a spider spawner. 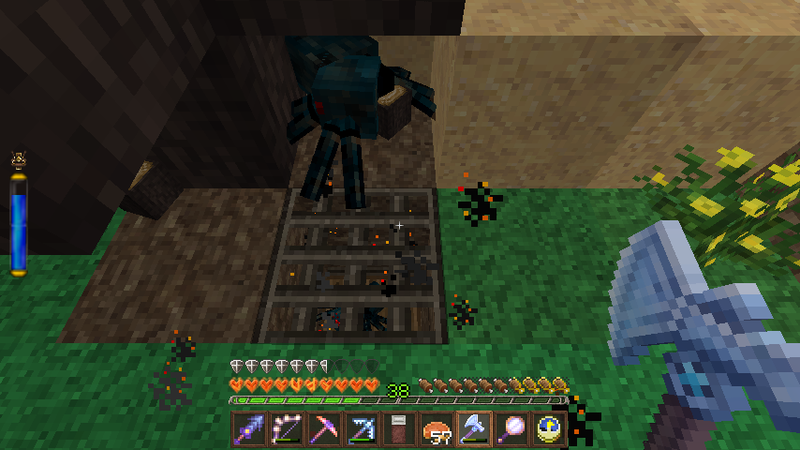 I chop to expose and stop the spawner but a spider manages to spawn first. I kill it with my axe and endure the poisoning. From the bottom trees obscure the view of the mountain, so I'd lose one of the big selling points of a high-altitude build. I could chop the trees, of course, but that would uglify the Forest and I don't want that. The Dunes end here and yield to Sahel. This would be nice and flat and friendly to the actual building - but - eh - not the right feel. So the second hill, for all its faults, seems like the best option so far. I return for a more detailed look. You may have noticed the water at the base of this hill. 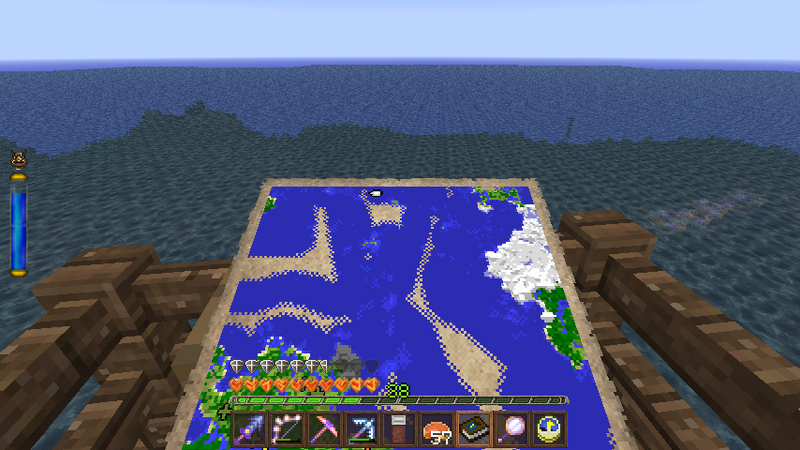 I like the idea of ocean access, even if I don't need it much anymore, so I check to see if it goes to the sea. Indeed it does. It probably couldn't take my deepsea magical powerboat as is, but I think I could with some moderate dredging. That's a big plus for this site. I've been doing some tiling research for this build and my plans require a tower of a very particular widths - 7, 12, or 23 blocks. 7 is really good only for decorative/auxiliary towers - the internal rooms are pretty small - and 23 would be a monster and very hard to place in this irregular terrain. I don't have a good shot to show it, but the flat area where the pig is standing is almost the right size. I'll have to dig into the hill a little bit and extend out into the water a little as well, but just a little and neither is a killer problem. 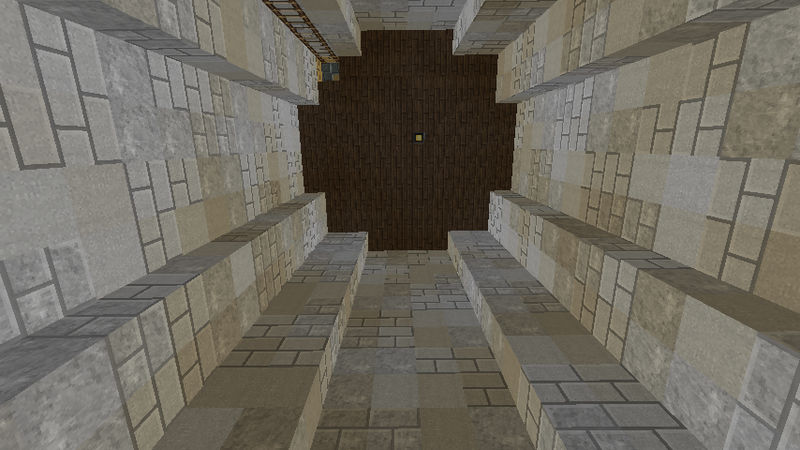 I'm itching to try my tiling ideas so I decide to build a tower here and see how it works. I don't have a plan for making a *palace* here, as opposed to a lone tower, but I haven't had any ideas elsewhere either so I decide to give it a go. Oh, and yes, there's a pig up in that tree. Having re-learned my lesson about Vishrooms in the last episode, I clear a few off the site and nearby and send them through the Hand to storage back at the Winter Tower. I also plant two Birch saplings I brought because (imo) they are the only tree which looks good in desert coloration. Next episode: It's building time! 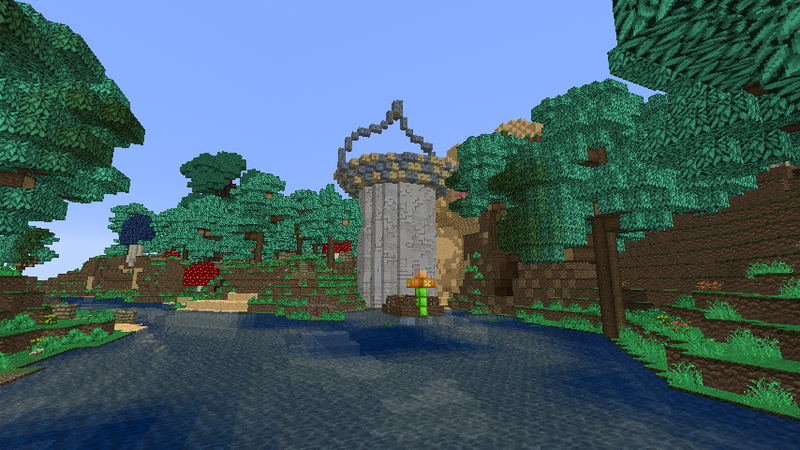 Excited to see how the Tower comes out, always loved the magical forest biomes. Episode 168: Nights or Nightmares? 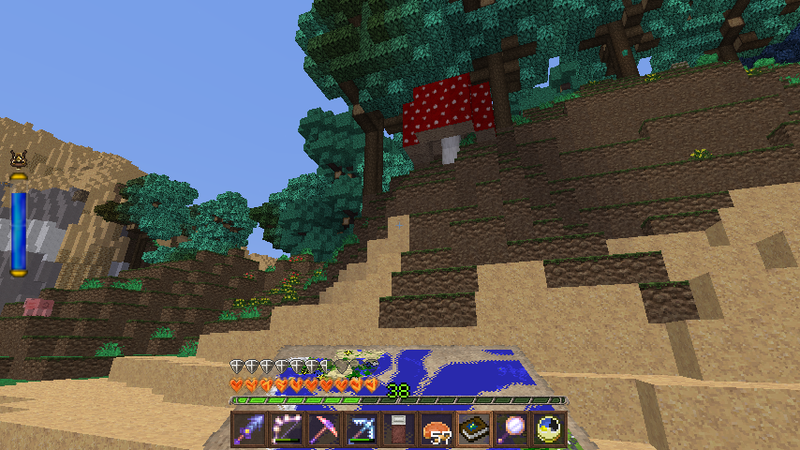 I plop down a base for my tower, with a 4-block separation from the hill so there will be room for my planned onion dome. You can see it fits, barely, with minimal terrain alteration. I'll use the riverside for a dock so extending into the water is actually kind of a plus. I'm planning for a golden ratio (1.618blahblahblah) height: width so I need a height of about 20. 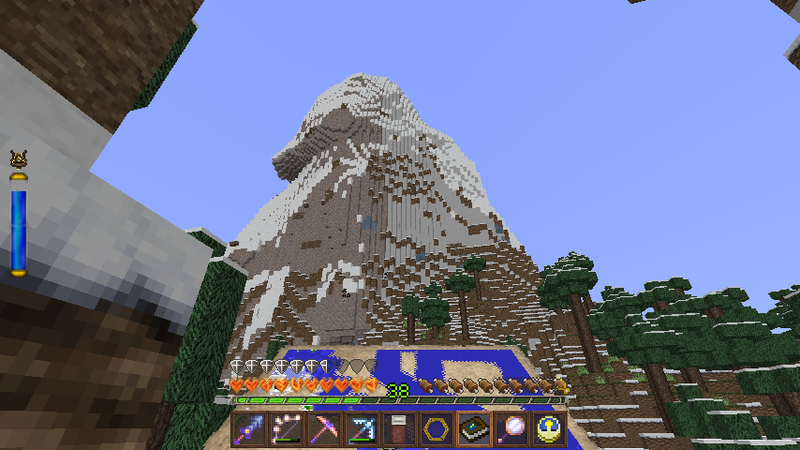 I build a 20-block high spire to see if its a good height and to check the distance from the hill. Preliminarily, it seems fine. I need some supplies on the boat, so I head back to where I'd moored it and move it to the mouth of the river I'm building on. As long as I'm here, I decide to try to bring it down the river to the tower site. WRUNCH! Nope, not now. But it looks so close! I decide to try to dredge the river. Having a route to the ocean was part of my reason for picking this site, after all, so I should test that. Incidentally, that spot of yellow (sand) poking up above the trees is the hill at the site. So, a tower there will be clearly visibly from the water approach, which is a big plus. Digging is fast and easy with my primal staff doing excavation and my Respiration helmet to let me stay down a long time. I try again - nope, still not big enough. More excavation! I end up spending half an hour on this "easy" job. This time I can get through. I have to do a little more excavation on some bends further in and - just -barely - can get through. I'll make another pass to enlarge it a bit before leaving. Soon I'm conveniently moored in the pond at the base of the future tower. Hmm, that tree has got to go. 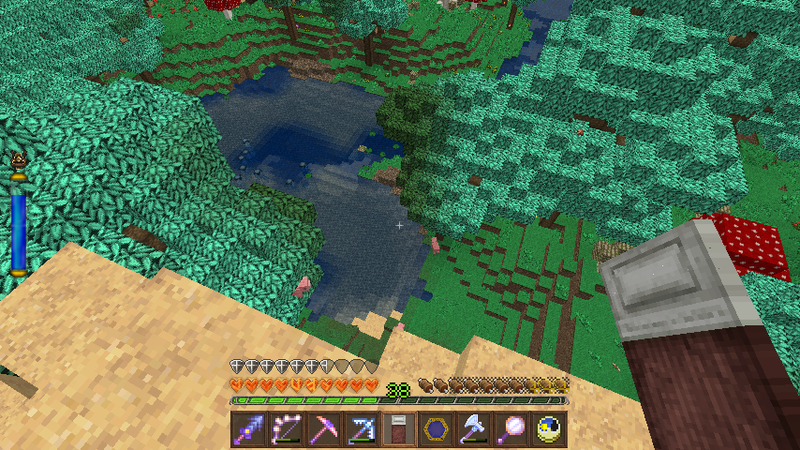 I pull out my Axe of the Stream (chops the entire tree, starting with the *furthest* wood from where you chop) and. 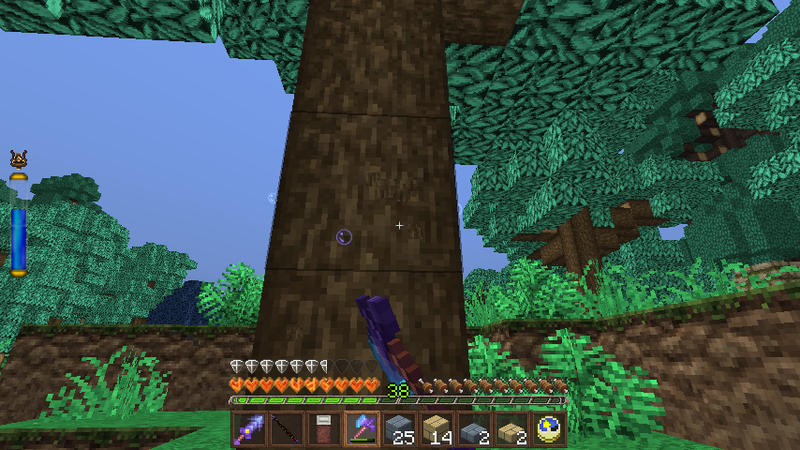 chopchopchopchopchopchopchopchopchopchopchopchopchopchopchopchop wait these trees aren't THAT big…. The leaves had interconnected with another tree which interconnected with *another* tree. I've chopped the entire third tree (which I had no desire to remove) and much of the second (which will probably have to go but I'm not yet sure). Oops. I chop the tree with a *regular* axe and check the damage. Actually, I'm fine. I certainly have enough Oak wood now! I climb up to the top and make a vertical outline of the planned dome. I can check the shape, and I'll need this to guide the build later. Nice shape and size; I can live with this. The glitch in the middle is that I started the curve one block too far to one side and had to move over one in the middle. It'll be fine when actually built. Now it's time to try the tower. I did some research on aperiodic tilings with square elements and picked a hierarchical recursive tiling shown here http://www.quadibloc.com/math/til03.htm (the one on a square lattice). This tiling can be enforced with Chaim Goodman-Strauss' trilobyte and cross tiles, but I'm just going to use it without enforcement. So I made a 32x32 square and manually ground out the tiling in a paint program. 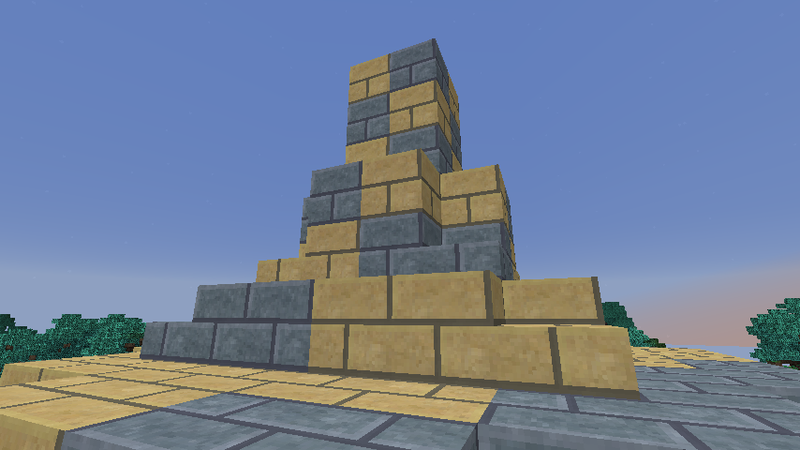 My idea was to use four "colors": two different stones, each in brick and smoothstone. The idea is to get a complex interlaced pattern from the contrast in stone and a different interlaced pattern from brick vs. smoothstone. Initially I tried coloring freehand, but that ended up just being messy. I tried again with a 1-2-3-4 sequence on the nested arrows. I was concerned I might get uncolorable regions, but it worked just fine. I'd been hoping for an Islamic feel but the resulting tiling felt more Escherian. Well, that can be good too and I may as well give it a try. My initial response to the first few rows was "all that work for this?" It's also *really hard* to place the blocks because the pattern is so complex and repetitive. Even with a guide I make a lot of mistakes. Initially I'd thought I could just make it on the spot with the basic rules. That would NEVER have worked. 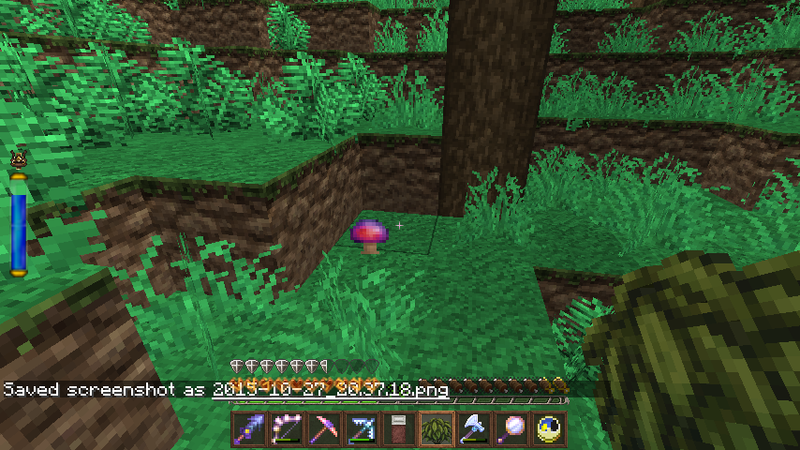 A tinklingThaumcraft wisp flew by to check out this nutcase slowly placing and sometimes removing blocks. Spawner wisps are usually hostile but wandering ones usually aren't and they provide nice atmosphere with a real magical feel. As I (slowly) build the tower higher I keep checking the look. After a while I decide the pattern does work, although you need to get a fairly large area to see the effect. The problem is using the brick-smoothstone distinct. As I said, I was hoping to get an interesting complex pattern from the 2 stone colors, overlaid with an interesting complex pattern from smoothstone vs. brick. 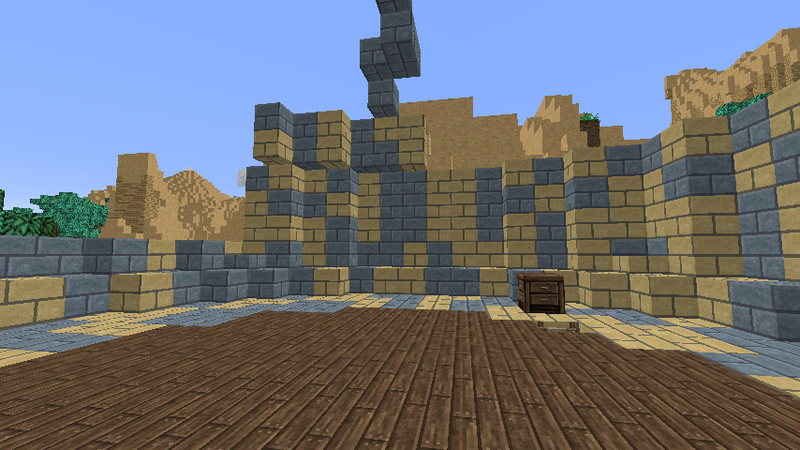 However, the smoothstone-brick mix looks like sloppy repairs, not an interesting pattern. When I'm done, it works from afar but not from up close due to the brick issue. You can see the tiling pattern if you can ignore the visceral "fire the contractor" response to the brick-smoothstone mixing. The basic idea is functional - I've just got to use different materials. A few of my more dedicated readers may be thinking "wait, a circular tower against a hill surmounted by a patterned onion dome? Haven't I seen that in an online server somewhere?" Other blog readers may remember a somewhat less similar, but still related, design in my previous journal (Episode 3). Well, you're just going to have to tough it out. I'm no neomaniacal 20th century composer convinced he must replace a 300-year old harmonic system a different way for *each* set of bagatelles. I find something that works, I re-use it, with improvements and changes. I had been thinking about the same two-stone brick-and-smoothstone design on the roof as I'd used for the tower walls. 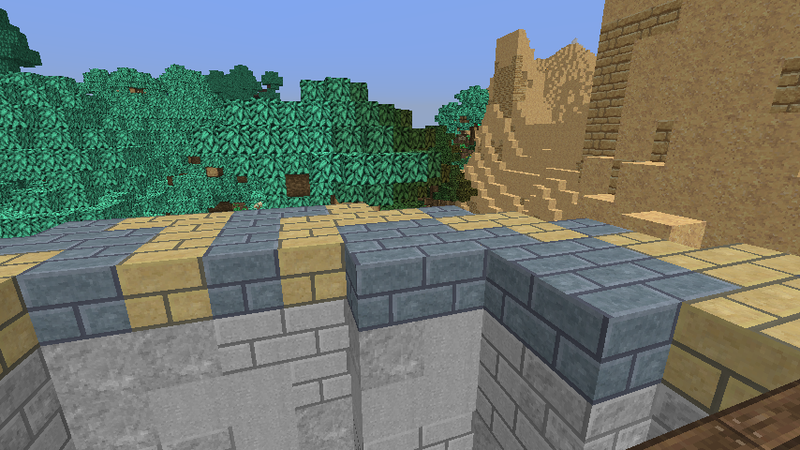 After seeing the problems with brick vs. smoothstone, I'm just going to go with a 2-color system. I have a number of options and decide on Blue Schist and Komantite, both in brick versions - blue and yellow is a classic Islamic color combo. The upper and lower parts of the dome can both be projected onto a flat plane, so I can just use the previous tiling pattern. I want some more symmetry, so I cheat some. I use four copies, each with the same corner in the center, and with the colors offset by one in adjacent patterns. The lower part comes out pretty well. Ideally I'd like bright jewel colors, especially for the blue, but I can't get colors as saturated as I'd like with my pallette. You can see that an all-Komantite dome would indeed have a problem with low contrast against the Dunes, but the contrast is acceptable with this blue and yellow pattern. The pattern will be fine for the top and bottom of the dome, but this leaves the sides. My initial idea was to do the top and bottom and then hand-design a tiling to bridge the gap on the sides. Unfortunately, even after over a hour trying to do this with a painting program it seems it just can't be done. The tiling is relatively tolerant for coloring because it has a lot of corner-to-corner junctions, which means you often don't need the full four colors needed for an arbitrary plane design (like how you only need 2 for a checkerboard). But all my attempts at tiling the bridge need more irregular tilings, so fewer corner-to-corner junctions, and a more restricted coloring. With particular colorings needed for top and bottom, I just can't make it work. Eventually I figure out a way to make the top and bottom tilings extend onto the flat sides by distorting them at the corners. They meet at one row with both specifying the same colors. This means the shapes aren't right and leads to some larger same-color areas, but the result looks acceptable. Neither issue is significant at a distance. Because I'm only using 2 colors the shapes are much more irregular anyway. The dome has been even harder to do than the tower because the patterns are much more ambiguous with only 2 colors and I'm frequently getting disoriented. Actually there are also some errors I can see here, now that the whole pattern is visible. Fortunately, there's no aesthetic problem because the same ambiguity that tricked me into making the mistakes also makes them invisible. Nice views as always while I'm up working on the roof. I sleep during the night because I fall off from time to time. Often I can work through the night on a roof because if I fall it will be into the building but not here, because the onion dome overhangs the wall (and it's steep too). The upper dome turns out to be maddeningly difficult. I have to translate the 4 colors on my guide into the two colors on the roof mentally; I have to keep track of what circle each block is to decide the height; I have to not fall off, and I have to do all this in an increasingly complex welter of ambiguous blue and yellow pattern. I make mistake after mistake. I get several opportunities to enjoy the views from up here - this is the Dunes view. You can see from these two pics that from the build, at least, there will be a distinct Arabian Nights/ Magical Oasis feel just from the views. Because of the onion domes, it will be a little tricky to actually get the views, but I'll manage. Eventually I'm forced to lay the rest of the pattern out flat and then build the rest of the dome above it by matching the colors. This way I only have to do two complicated mental manipulations at once, rather than four. The pattern doesn't extend properly to the last two widths making up the spire. Actually, because of the cheat, the tiling is undefined for the innermost circle. I just use this checkerboard. Finally it's done. The dome has a very nice shape and the pattern works well. I plan to put windows and terraces in eventually, but I want to figure out how it fits into a larger structure before that kind of detailing. The interior of the tower is kind of interesting, the "fire the contractor" effect notwithstanding. Normally I'd put in some floors but maybe I can figure out a way to conserve this. I'd need to figure out something to do with this height, though. The interior of the dome, however, disappoints me. The interior of the somewhat similar dome I built in Dulciphi's world had a glorious uplifting interior but this seems more ordinary. Smaller size? The color scheme? Lack of large-scale patterns? I don't know why, but it's missing that "wow" factor. 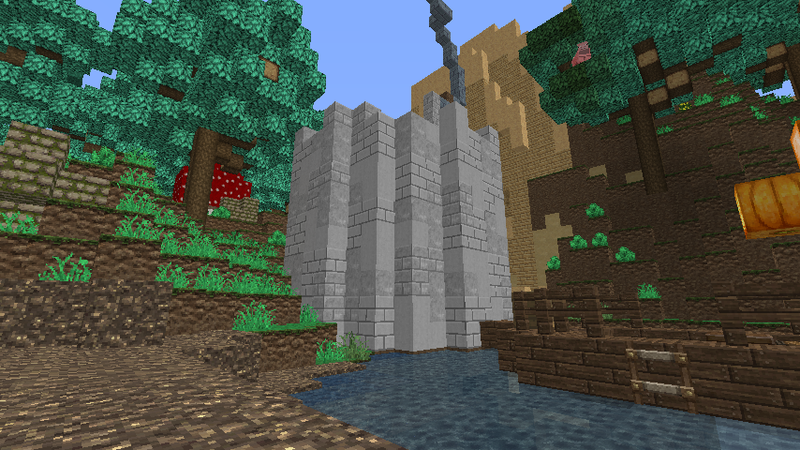 The next question is: can I make this nice onion-domed tower into part of a palace, and if so, how? I toss around some ideas in my head for a while. My earlier ideas were on the line of a few fancy towers guarding some large gardens, but I don't have the flat space to make that workable. 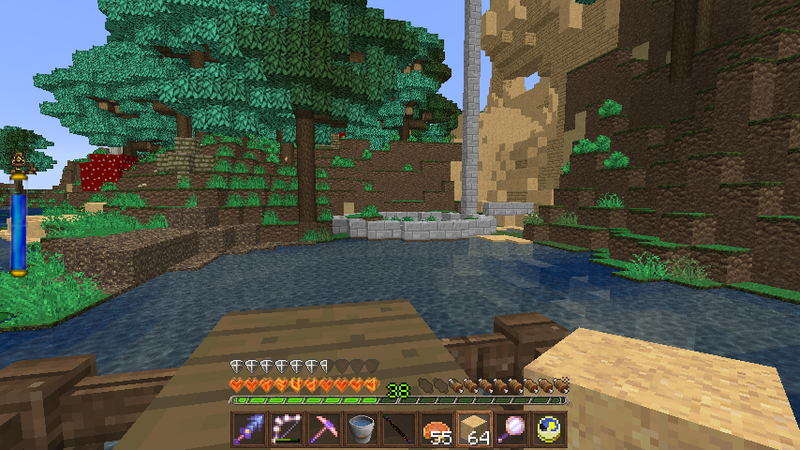 A tower atop the hill seems pretty obvious, but that would look disconnected from the tower on the river 20+ blocks below. After a while I hit on the idea of having multiple towers of different heights clustered very close together. Domes at heights inbetween the river height and the eventual hill dome height could serve to tie them together. So, now to see if that's workable. So, the idea I'm playing with is to have multiple towers very close together of at least very similar shapes, with the domes at different heights. I'm going to try to build them with the towers actually *touching* the nearby domes as that will allow connecting the towers up in the air and getting between them more easily. First that tree that I partially chopped by accident two episodes ago has to go. It's right where the towers will touch. It's no longer touching anything and comes down easily. 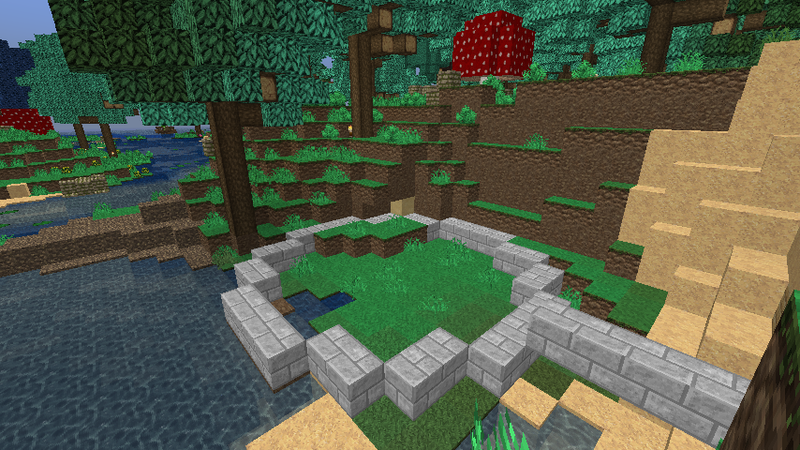 Next I build a test circle where the base of the tower will be. For reference, the Dunes hill is to the West and this is to the southeast. I have to adjust it because the initial circle goes a little too close to the water. I'm also making sure there will be four blocks of contact between the tower and the existing dome for a nice double doored connection. 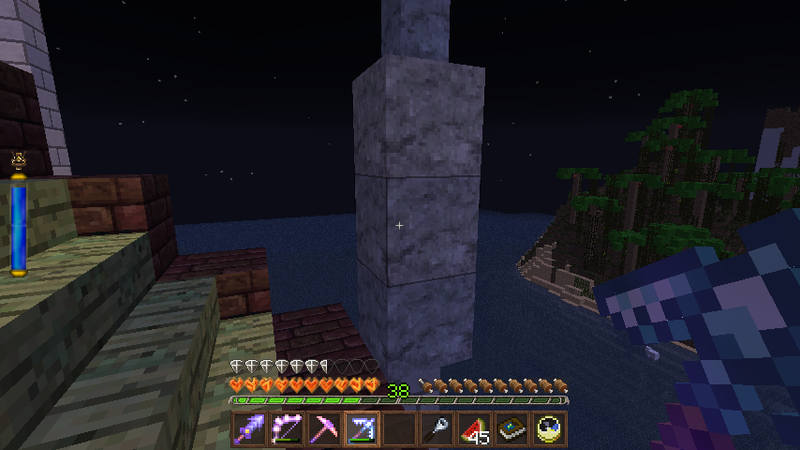 Next I build another test tower base on the south side of the existing tower away from the river. The plan is for this dome to in turn be even higher than the second will be but the base will be at about the same height so the tower will have to be significantly higher (10 blocks, I think). That's not a big problem as the pattern is infinitely extendable. I'll lose the golden ratio but oh well. Finally I consider a tower on top of the Dunes hill. A few more blocks back the hill is wide enough for a tower (and I actually build a test circle) but that's far enough away that it won't connect. Closer to the existing tower it's too narrow and I'd have to fill in the right side of the canyon here - which I *could* do although it's a lot of work to make an artificial slope look nice. Even there it probably wouldn't directly contact any of the towers I'm currently building, although I could have a connection from the existing riverside tower into the hill itself and put in a basement. 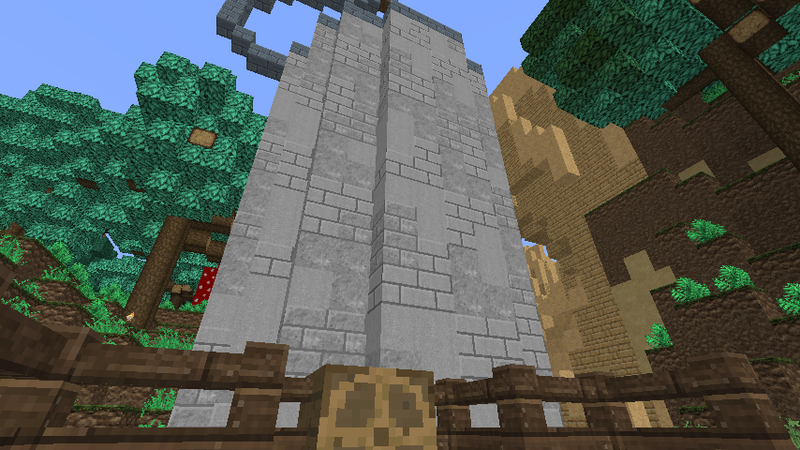 I decide to build the two towers I'm planning now and then try to fit in a hilltop tower later. The gray circle is the existing dome. 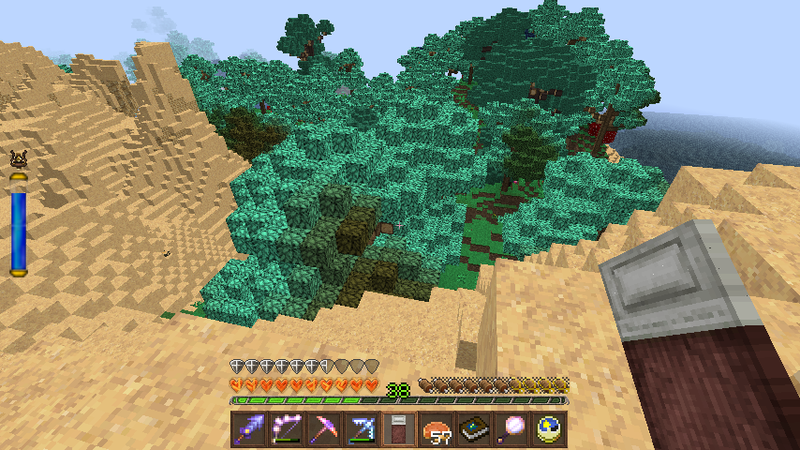 Dunes are to the left, Magical Forest to the right, and the ocean is about a map length to the right. The circle touching the dome on the lower left is the first one and the one almost directly below is the second. Confusing, there are some moss stones in between those two circles creating that partial semicircle; ignore it. The tower base that fits on the existing hill is the circle in the Dunes; you can see there's room between it and the existing dome for another tower but the area would need to be raised some first. The next problem is material. On thinking about it, I realize pretty much every dome and tower needs to be built of a unique material set or they'll blend into each other (this problem comes up with the Fallingwater build where from some angles it's hard to see what is building and what is mountain in the background). 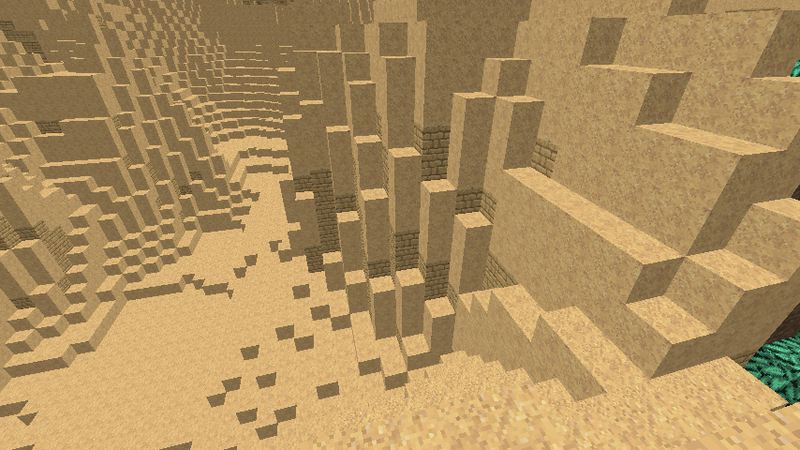 So I can't build yet; I've got to do quite a bit of quarrying first. I head out to the river to clear it out a bit more so I can take the boat out and go stone-hunting. This is the view of the tower from the river mouth, just in from the ocean. It looks nice, although it's a little bit small. With my current plans there will be another tower to the left and in front, an even taller tower beind that, and finally one about 30 blocks higher than the existing one on the Dunes hill behind the existing tower (now hidden by the dome). I think that will be a good size to be seen from this side, at least. 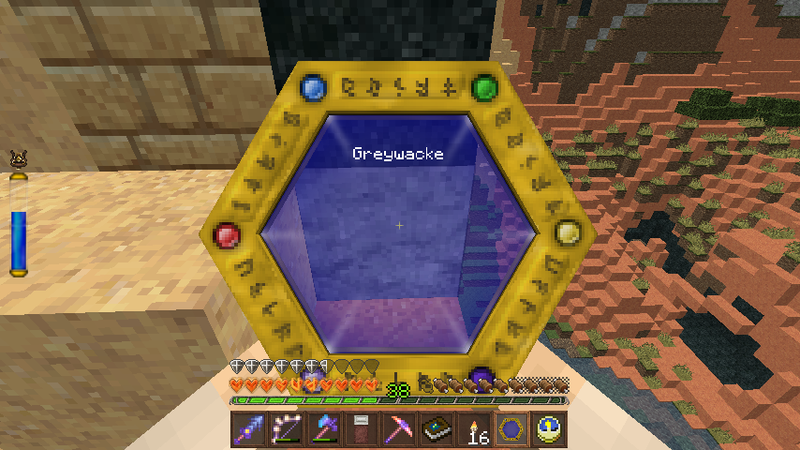 Before I leave I link a book to here, head back through the Nether Nexus, rename the link book, and place it on a lectern in the Nether. Then it's out to sea. I have a primary target in mind: on the island north of the spawn continent which I explored in Episodes 103 and 104, there's a Badlands with exposed Greenschist (which I want for color in domes) as well as Greywacke, which will be good for the towers. There's also a Mesa nearby where I can get hardened clay. Generally I think Hardened Clay is a little dingy for a flashy build, but there are exceptions. There's a (Highlands) Outback a little bit up. It occurs to me that Red Sandstone might be a good material but I'm not sure if Highlands has it. Google does not reveal the answer, so I stop off and try. No dice. There is Greywacke here, but on this expedition, at least, I'll go ahead and get it in the Badlands. I return to the boat. I travel along the coast, paying careful attention to the stones available. This set is Quartzite, with a layer of Chert. I'm now thinking of making the palace into a showplace for Underground Biomes stones, using at least most of the stones to fill the need for a wide variety of colors. I won't be able to get the domes as brightly colored as I'd been hoping, but a great splash picture for Underground Biomes would nicely compensate for that. 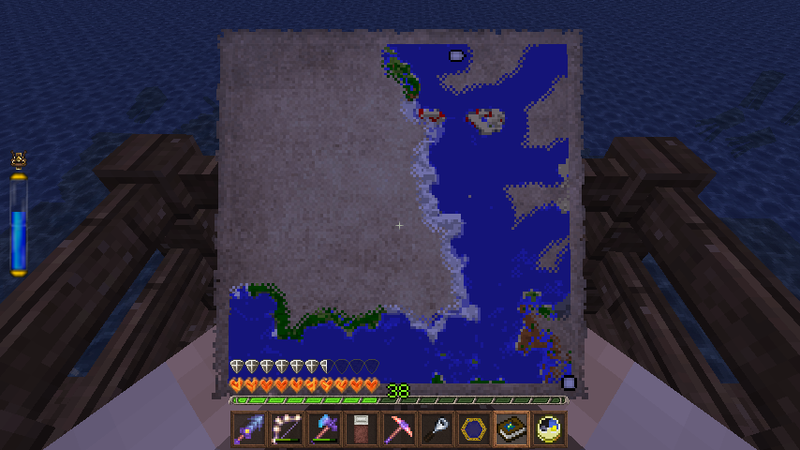 As I move onto the map with my target island (the map 2 north and 1 west of spawn; the target island is on the lower right). 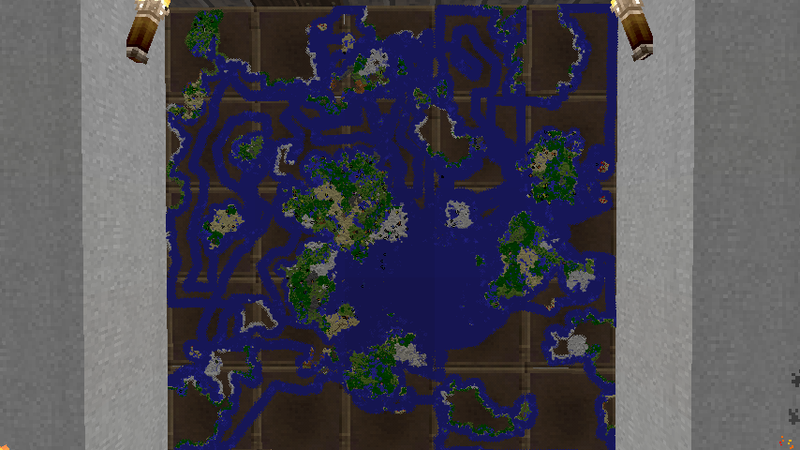 I realize the ocean part of this map is almost done. So, I figure I'll finish that off first and then do my quarrying. I round that peninsula and then head north on the coast. 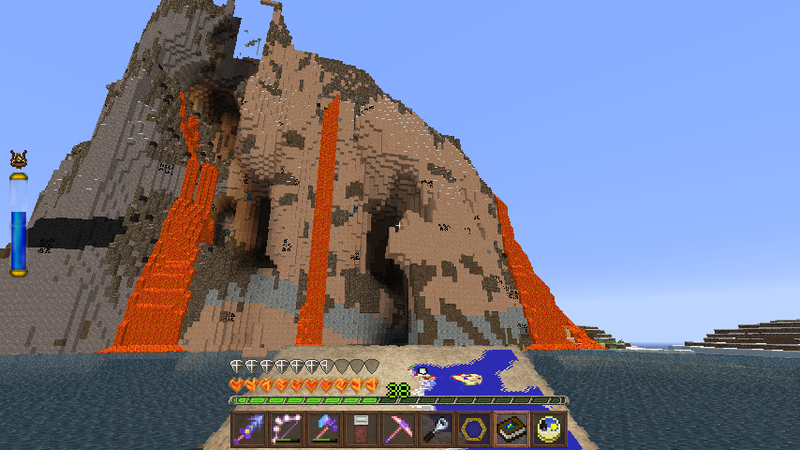 Eventually I reach the pair of volcanoes I first noted in Episode 33. 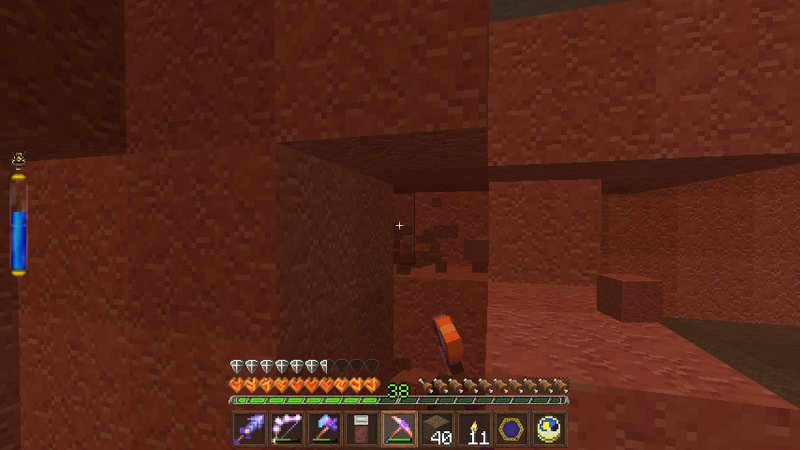 There's Red Granite here, which is definitely a stone I want to use, but I don't want to quarry here as there's a lot of lava blocks in volcano and that would make quarrying a hassle. Fortunately the Red Granite extends onto some normal biome nearby (a Mega Taiga by the looks of it) so, if I choose to get it, it will be easy. 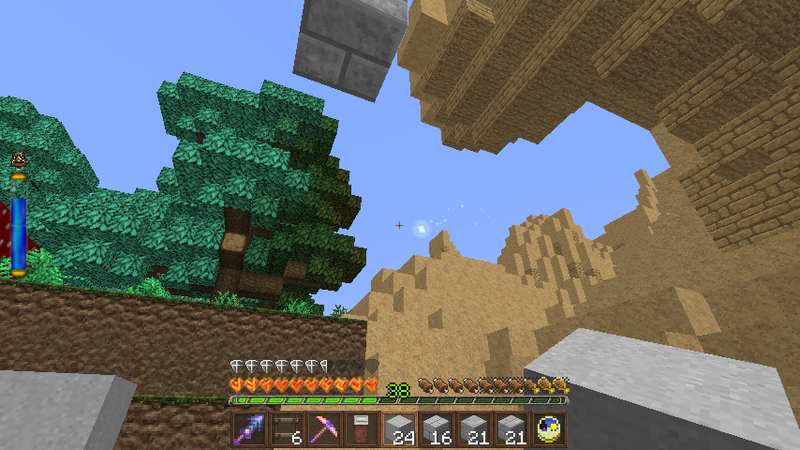 I reach the top of the map and turn right along the top edge. You can see night is falling but I have about a night's worth of ocean exploration so not an issue. 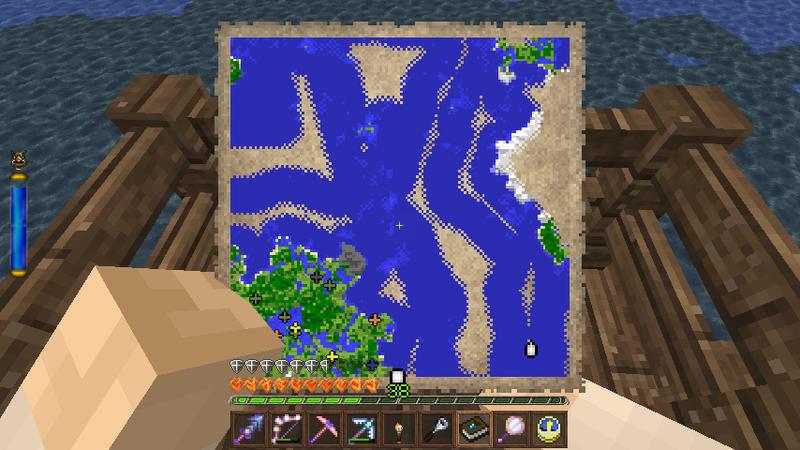 I finish off the ocean on this map lawnmowering around and then head to my target island to finish exploring it and to do some quarrying. It's still night when I arrive so I moor the boat a bit offshore and sleep to get to dawn. Next episode: some land exploration and mining. Come dawn I reactivate my magical speedboat and head to land. I get about 10 blocks, then snap back. Hunh? I try again - same effect. I try going backwards - same effect. Must be a bug. I log off, log back on and - same thing! I deactivate the boat and jump off to look. My boat has become attached to kelp strands (BoP) underneath. The move-and-snap-back action is almost certainly a bug because the boat probably should just not move. But what a fortuitous bug - that's exactly what *should* happen for a boat tangled in heldfast kelp! That annoyance fixed, I move close to the shore, moor my boat, and go ashore. Just south of me is this mixed area of (Highlands) Outback, Ocean, and flooded Outback. 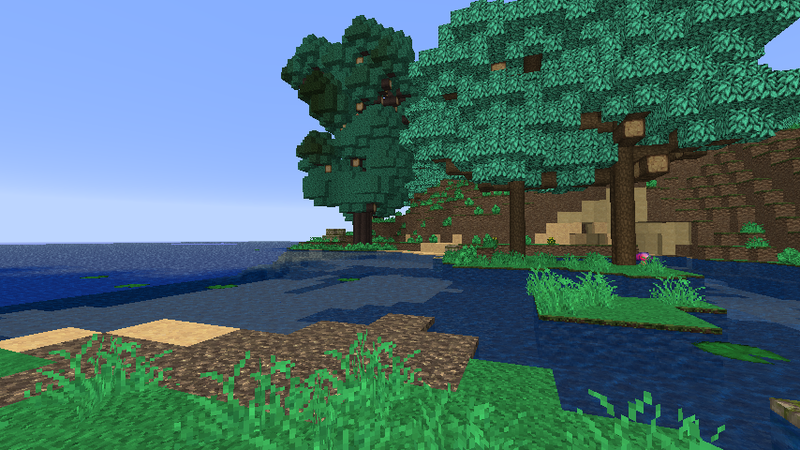 Even next to the ocean, vanilla biomes other than swamp mostly stay above water, but modded biomes sometimes end up with large flooded sections when near the ocean. I don't know exactly why this is. Outback seems particularly prone to it. I splash around a bit in the process of mapping it all. No crocodiles, fortunately. 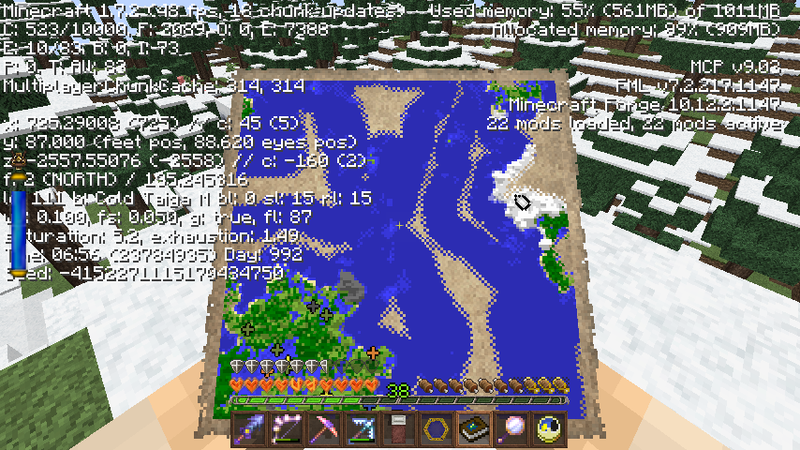 Once that's all mapped, I head east to the next map (2 north of spawn). This has the rest of the island to map, and also the mesa I'm planning to collect hardened clay from (in orange) and the Badlands with the Greenschist and Greywacke (the grey-flecked green above that). I'm crossing some Savanna to get to the mesa and I spot these hills in the Savanna. They look too irregular to be Savanna plateau but too mild to be Savanna Plateau M. I climb on and it is indeed Savanna Plateau M. Either some rearrangements by Climate Control or luck of the noise generator trimmed it to the striking yet still plausible hills. 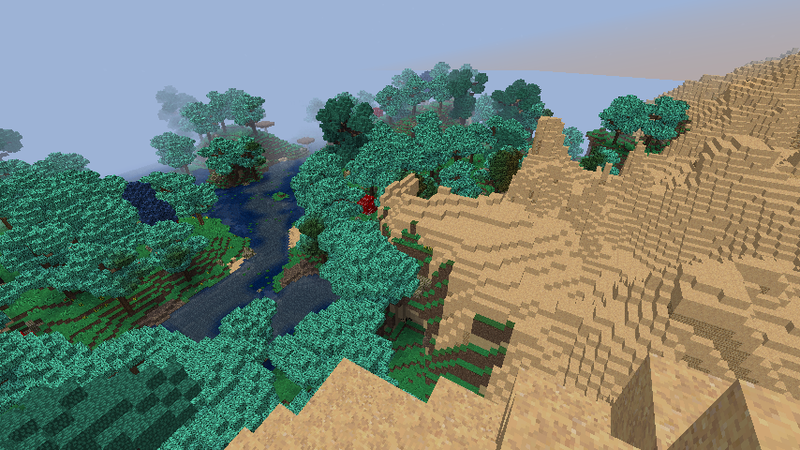 IMS (in my suspicion) this is the effect Mojang was trying to get with the M biomes - occasionally generating some striking (but not crazified) terrain to cut down the repetitiveness of the biome-based terrain. As so often with Mojang, I think the idea was sound but the execution inadequate. Most "ordinary" M biomes (excluding those meant to be strikingly different like Flower Forest) are barely distinguishable from ordinary terrain, while Savanna Plateau M is off-the-charts crazy compared to the rest of vanilla terrain. 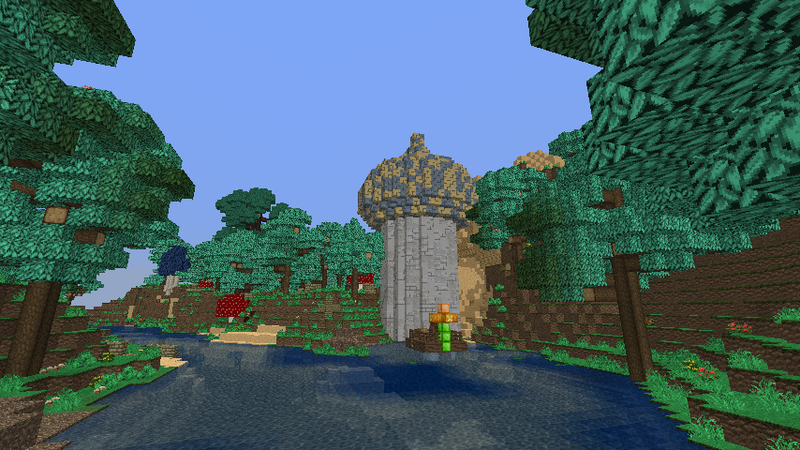 The other M biomes should have been noticeably different from their parents. There would be a lot fewer complaints about boring repetitive terrain if this kind of thing were scattered about at about 1 every other biome (the frequency of M). The Mesa is readily visible from that peak - I got here sooner than I thought. I also spot some Greenschist and Greywacke here and think "wow, how convenient! 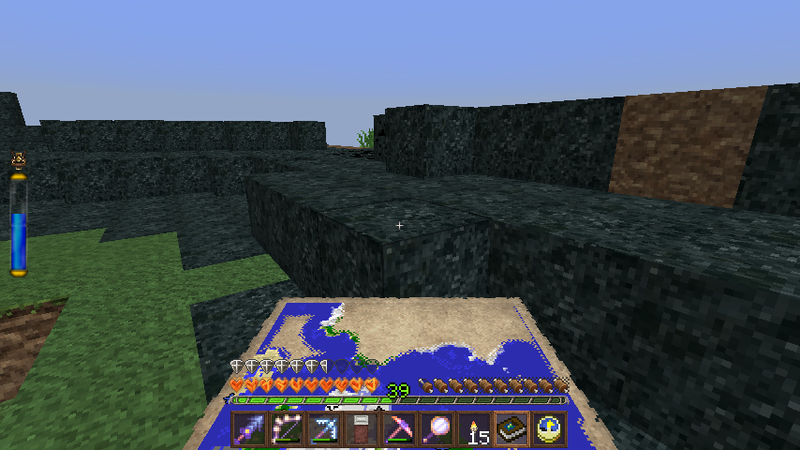 I can get it all in one quarry. 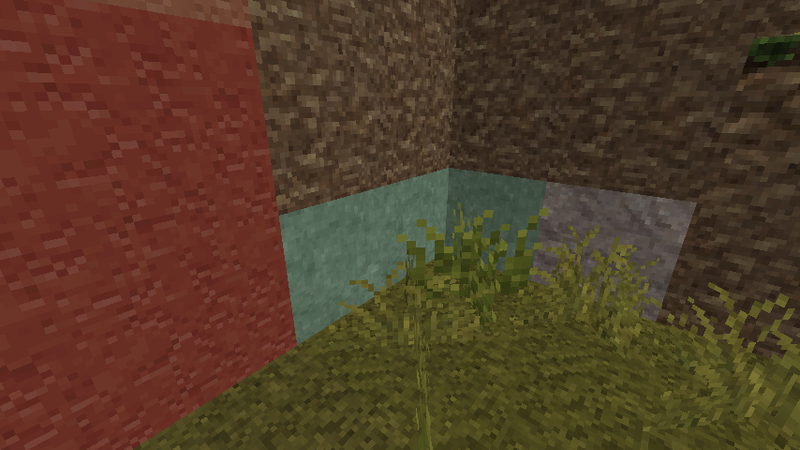 But the Greenschist/Grewacke underground biome is just a tiny sliver between the Mesa and another underground biome so I'll have to quarry it elsewhere after all. 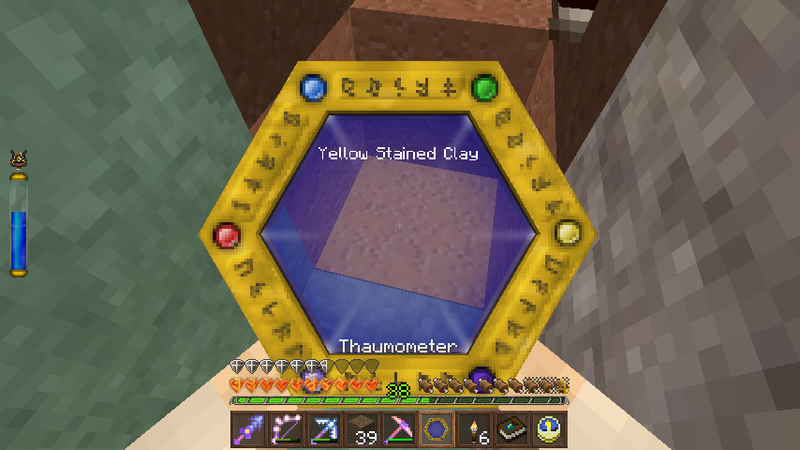 In the process of quarrying that, I spot a layer of yellow stained clay. This also has a neon saturated color I think might be useful but I'd not planned to quarry it as it's only one block thick. But, as long as I'm here, I may as well get some. Generally when I quarry rock these days I send it through the Hand to be smelted at home. Clays and sedimentary stone, however, don't need to be smelted so I put them into Spunkie. Generally I'm trying to get about 6 stacks of each block as that's about what I used of each material in the first tower. Once I've quarried enough there I move on to the Badlands and start quarrying Greywacke from the surface. Quarrying that exposes a vein of marble, which I go underground to quarry as well. Next I quarry Greenschist from exposed formations. 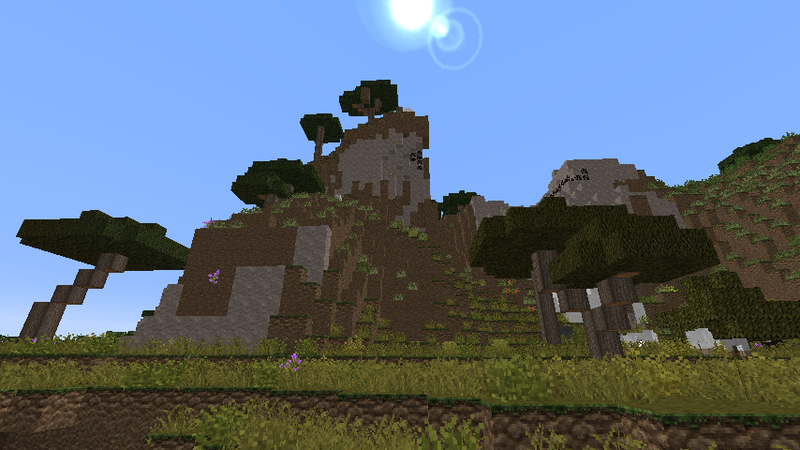 I quarry from protruding formations so I can just shave some off and it's not too obvious the land has been modified. Typical Zeno environmentalism. That done, it's back to exploring. You can see the three spots I've still got missing. Right next to me is some Autumn Forest, which turns out to be comparatively tricky to navigate. Beyond that is an Extreme Hills, some of which is in Black Granite. Black doesn't fit with my current conception for the Arabian Nights build, but it's an attractive and striking stone, so I take the opportunity to quarry a few stacks. At this point I've collected all the stones I'd planned, but there's still some exploration left. 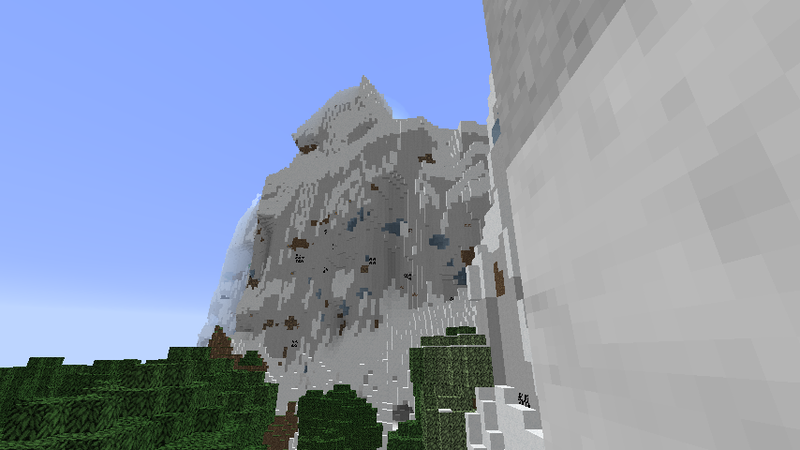 I then move to fill in the other two areas - a relatively unremarkable Ice Plains and then a difficult Rock Mountains. I take the opportunity to practice my (sad) parkour skills up here. I actually made the jump you see here, which somewhat surprised me. I'm really not normally good at this. A little more jumping around in the Rock Mountains and this island is fully explored. I get back on the boat just before dusk and take a well-earned snooze. Next episode: a little more exploring, then back home. I'm glad that I'm not the only one that does this. 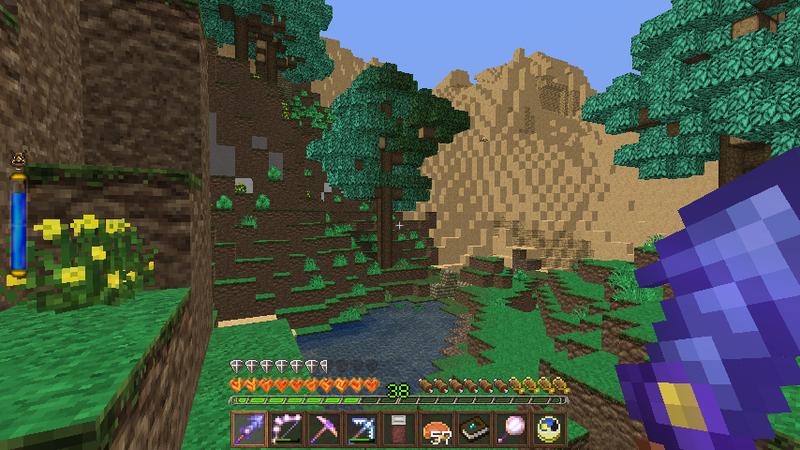 I'll admit that it's slightly annoying when I go someplace like a Mesa, Desert, or Plains on a public server to find that there's are multiple hills that have had their upper layers shaved off flat. Whenever I want dirt, I'll grab it from underground. If I want hardened clay, I'll hollow out part of a hill.